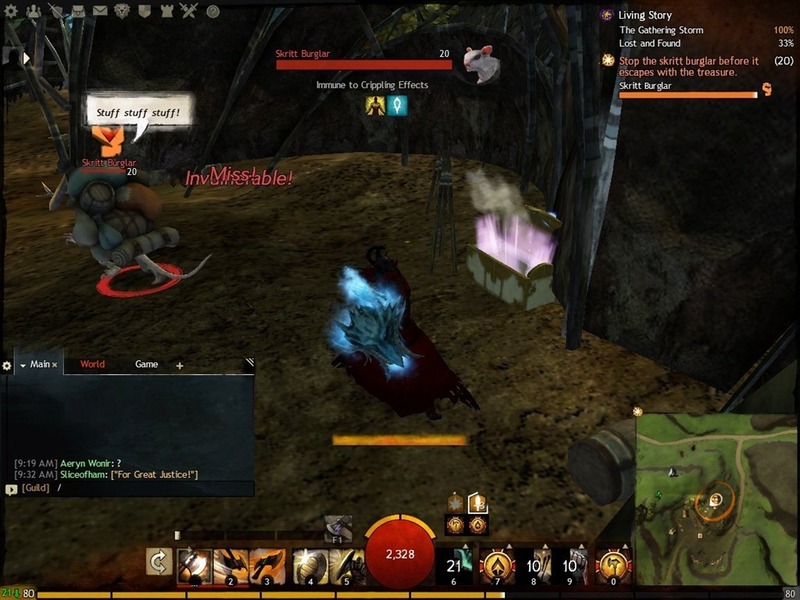 GW2 Halloween achievements guide including Emissary of the Mad king achievement and other Halloween related achievements under the Special Events section of achievements. 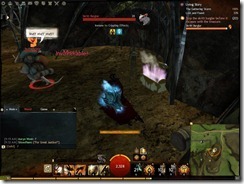 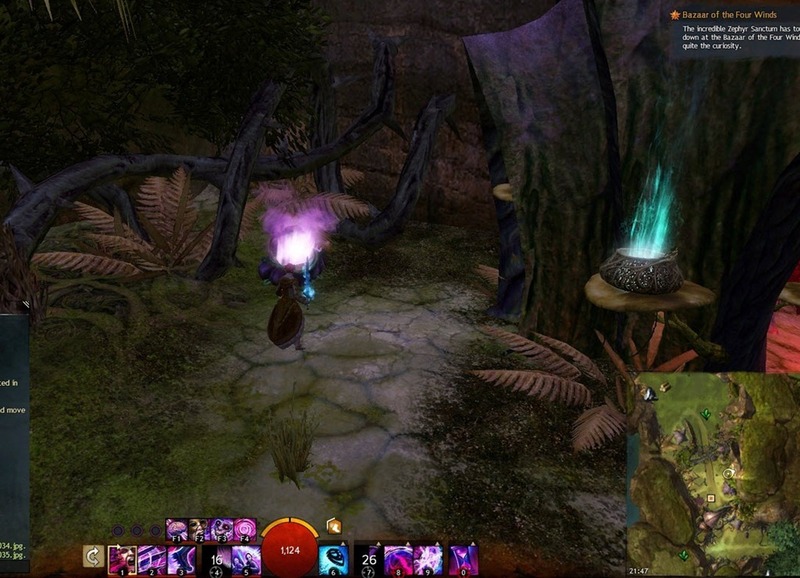 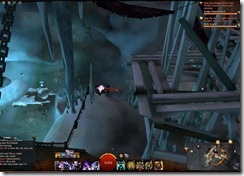 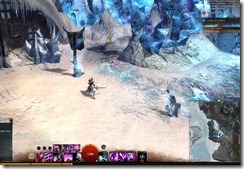 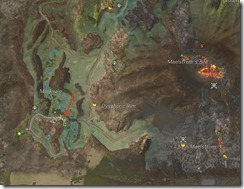 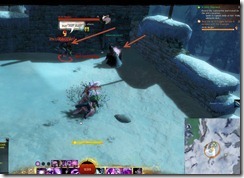 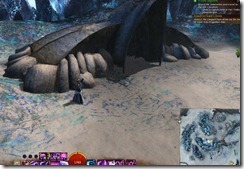 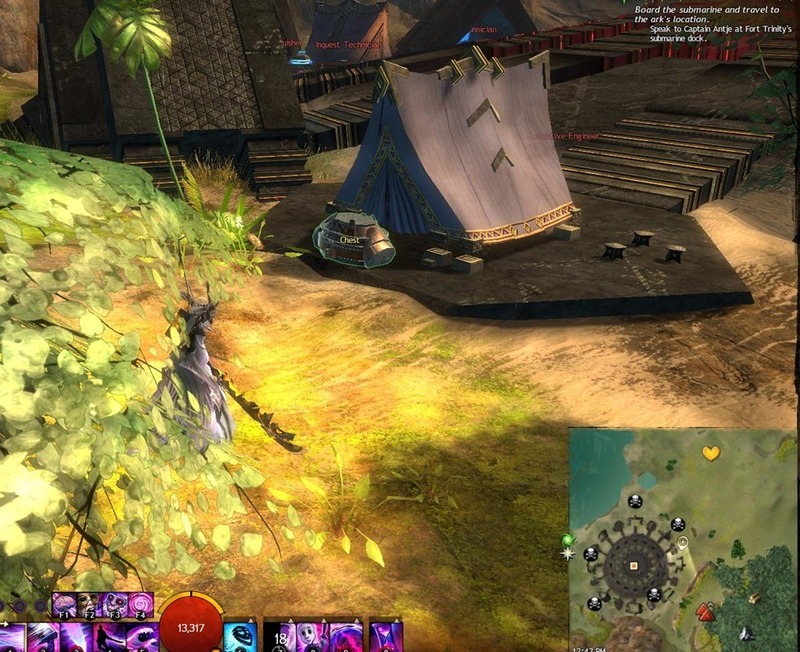 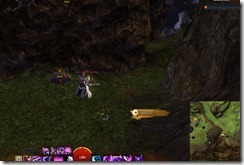 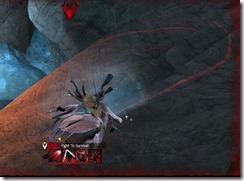 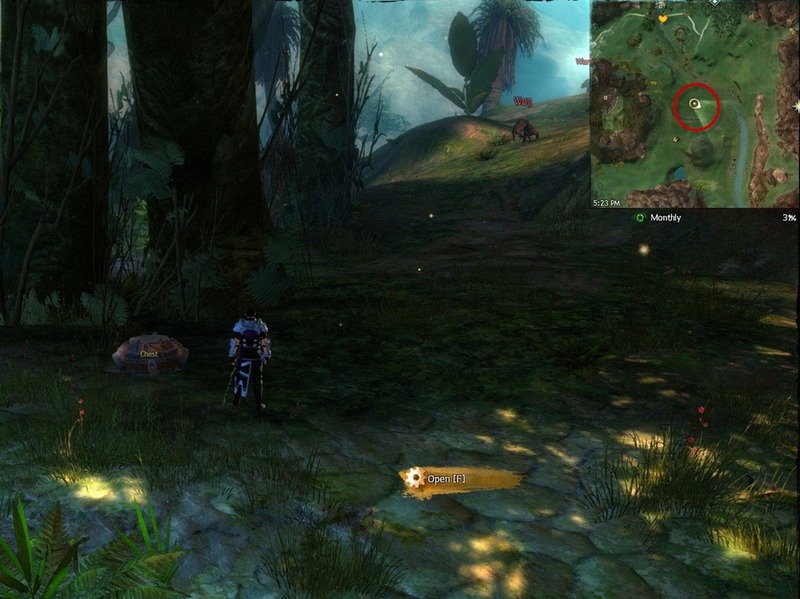 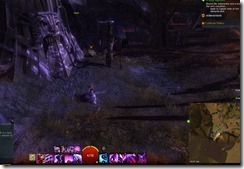 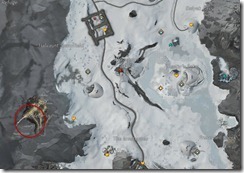 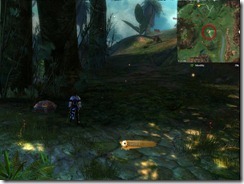 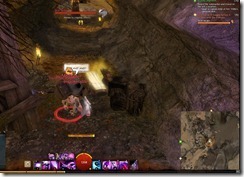 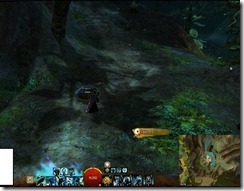 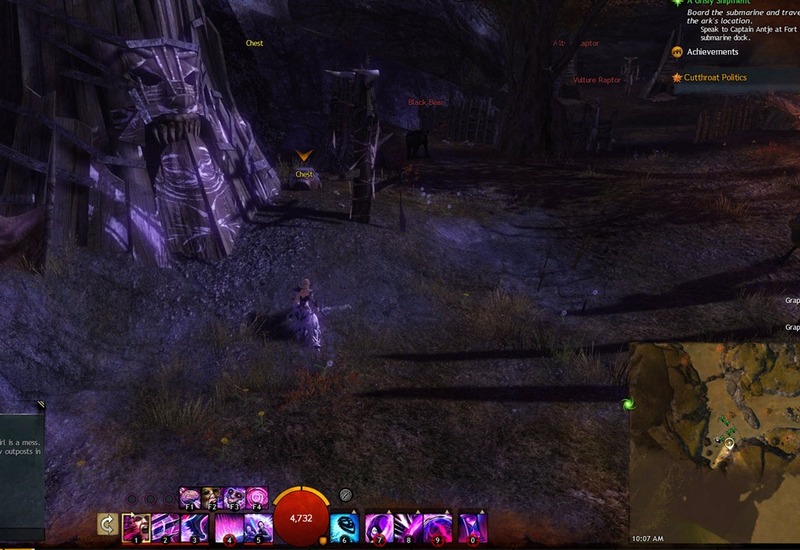 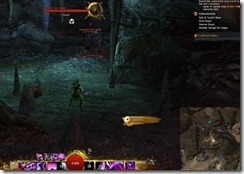 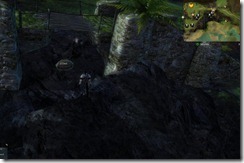 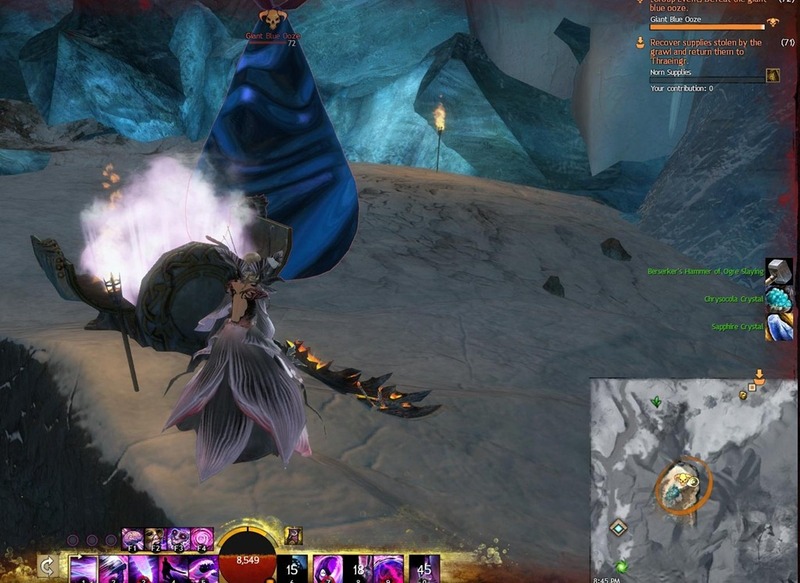 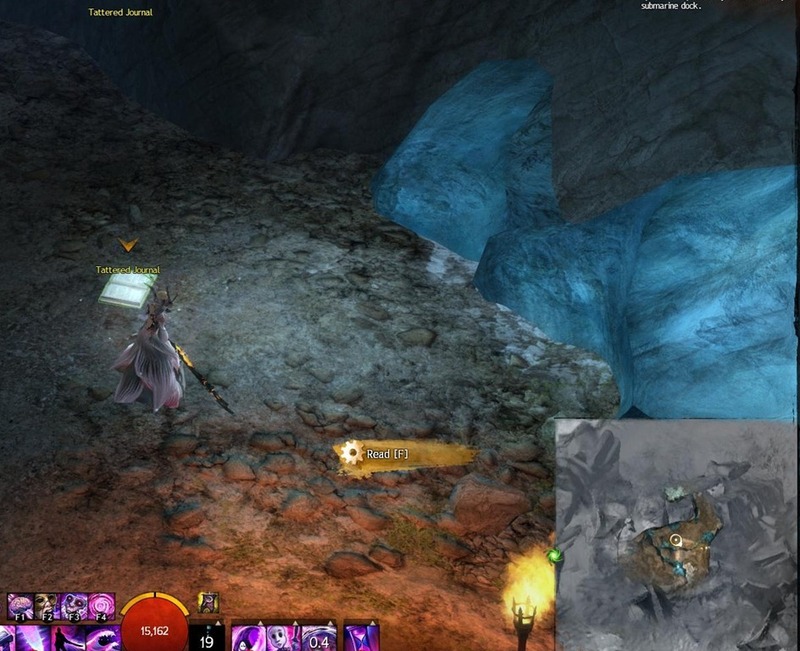 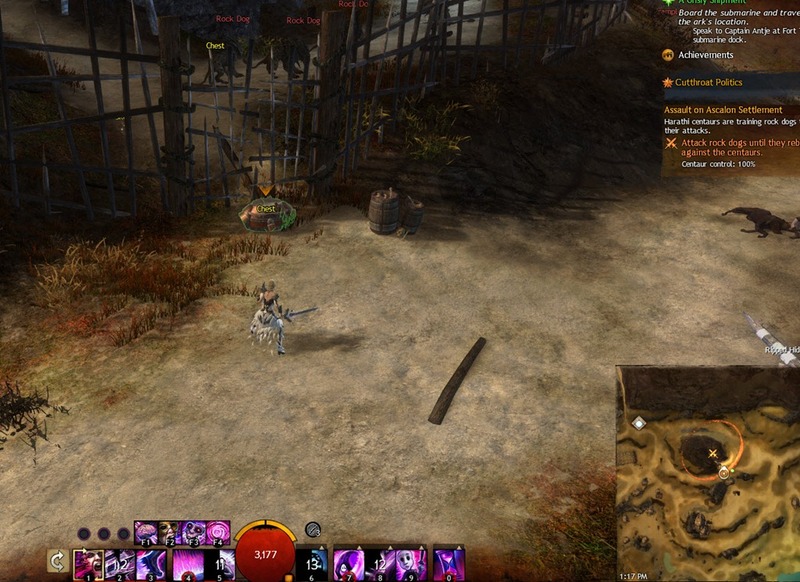 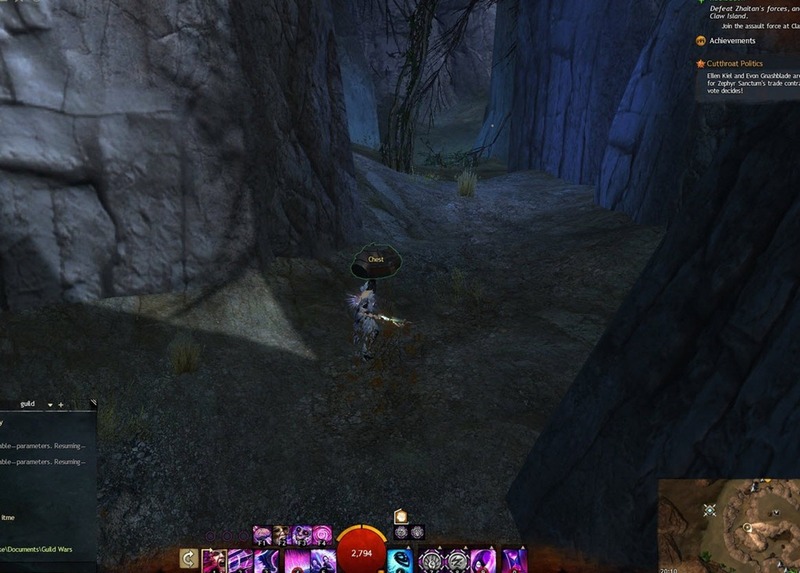 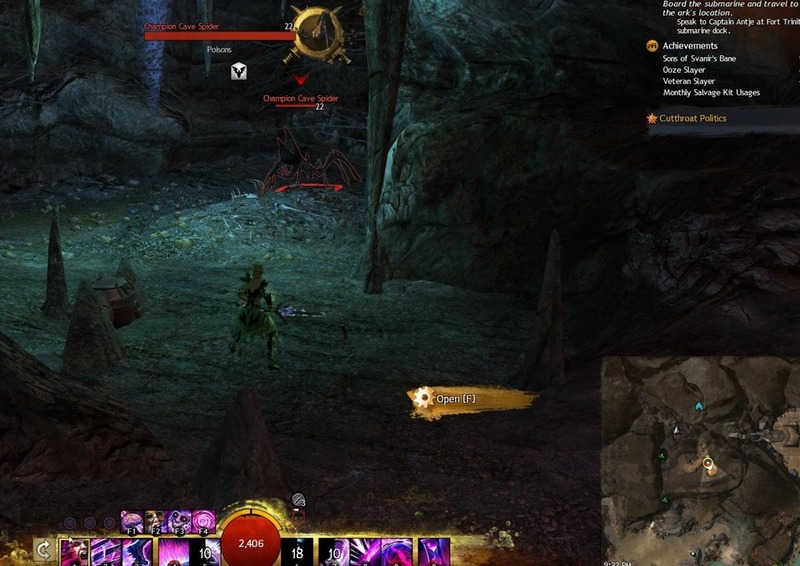 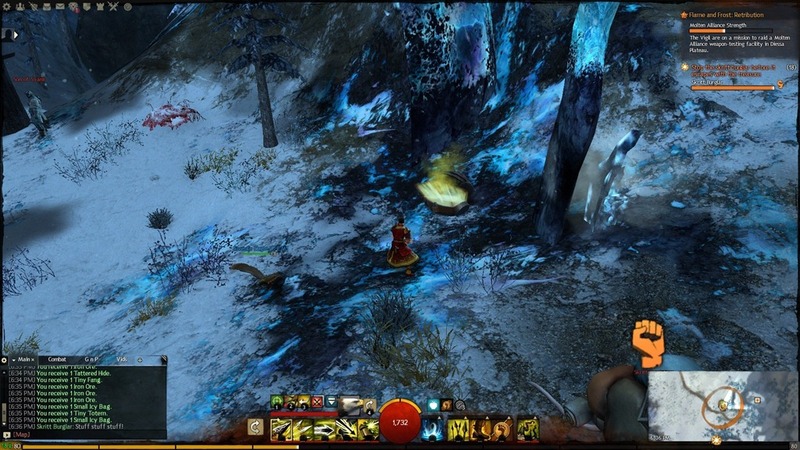 GW2 Shadow of the Mad King Mad Memoires Act II quest guide with detailed walkthrough. 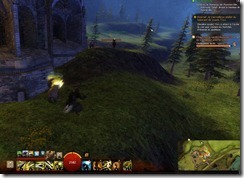 Click here if you did not do ACT I yet as you will need to complete ACT I first. 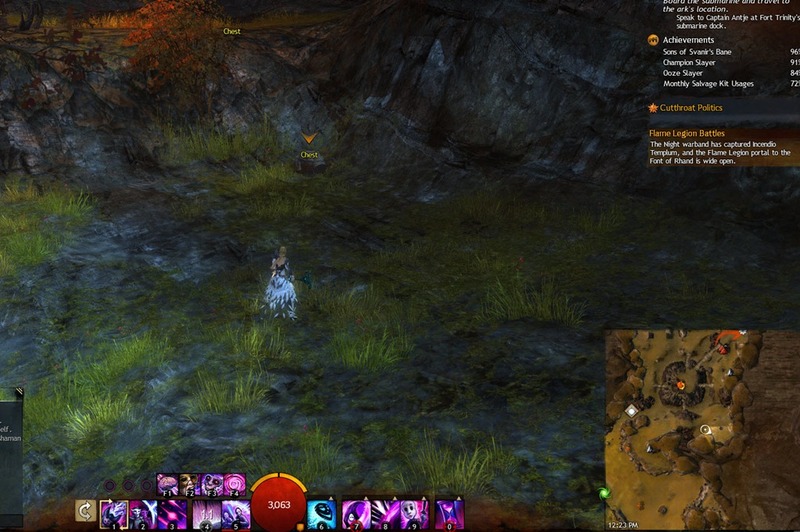 A list of the skins for armor and weapons obtainable in the GW2 Halloween event! 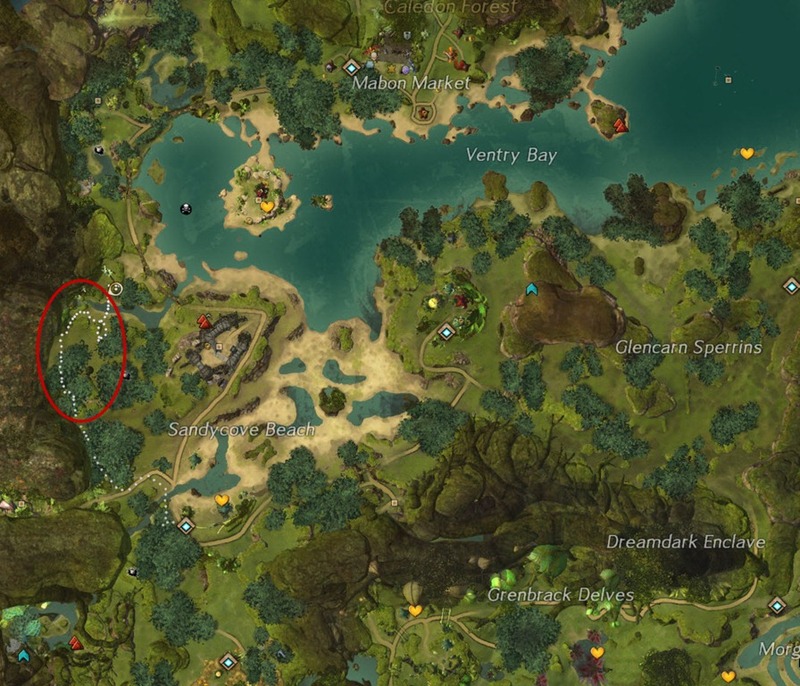 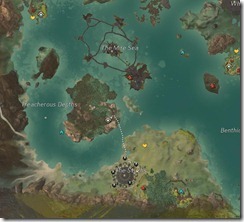 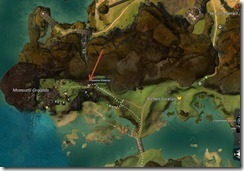 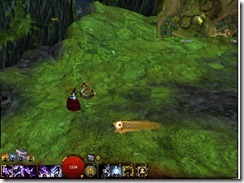 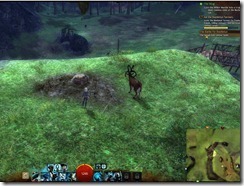 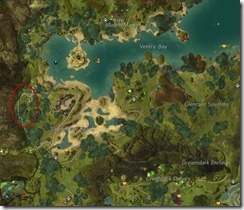 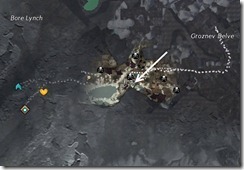 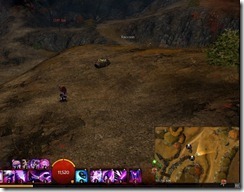 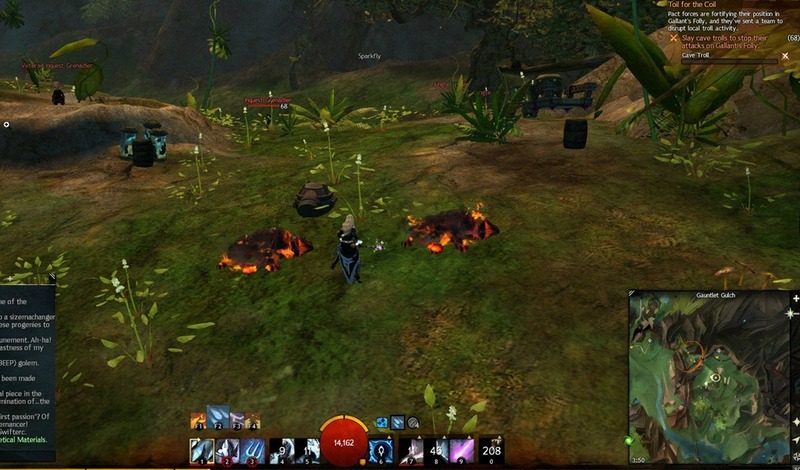 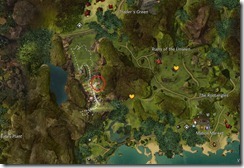 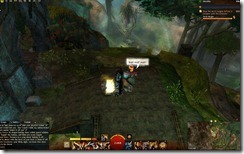 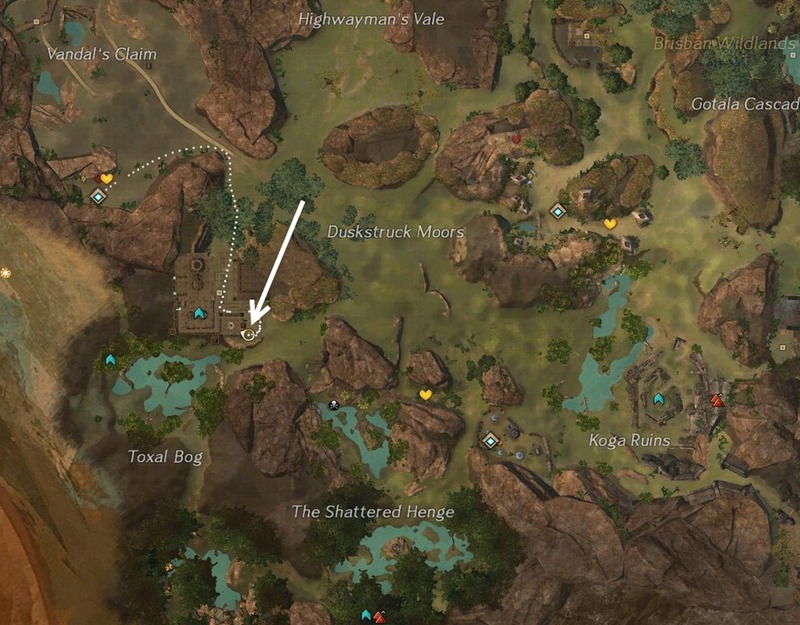 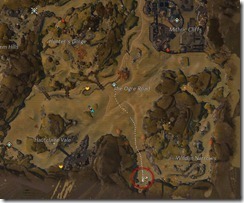 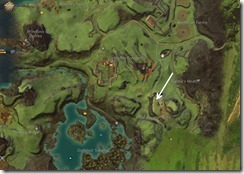 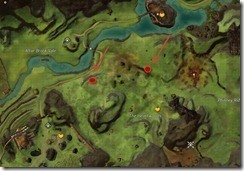 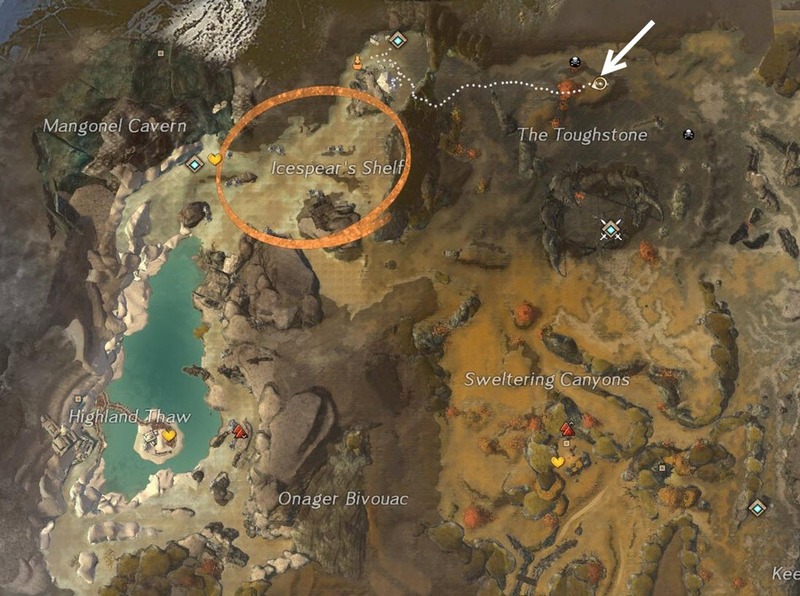 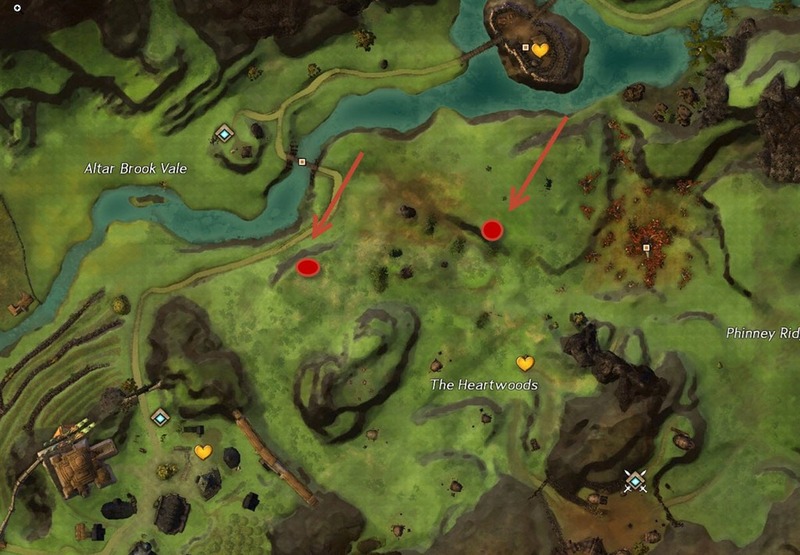 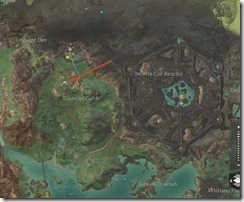 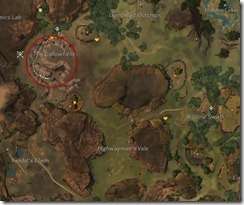 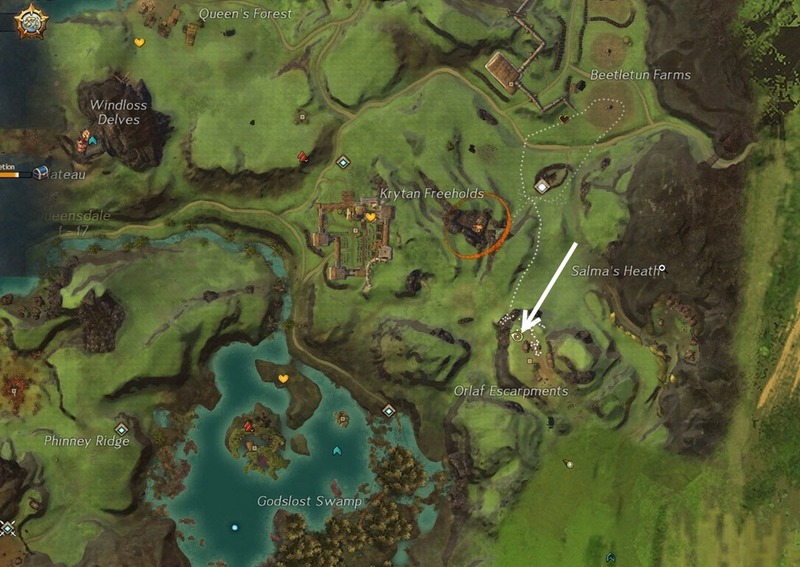 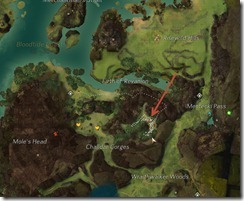 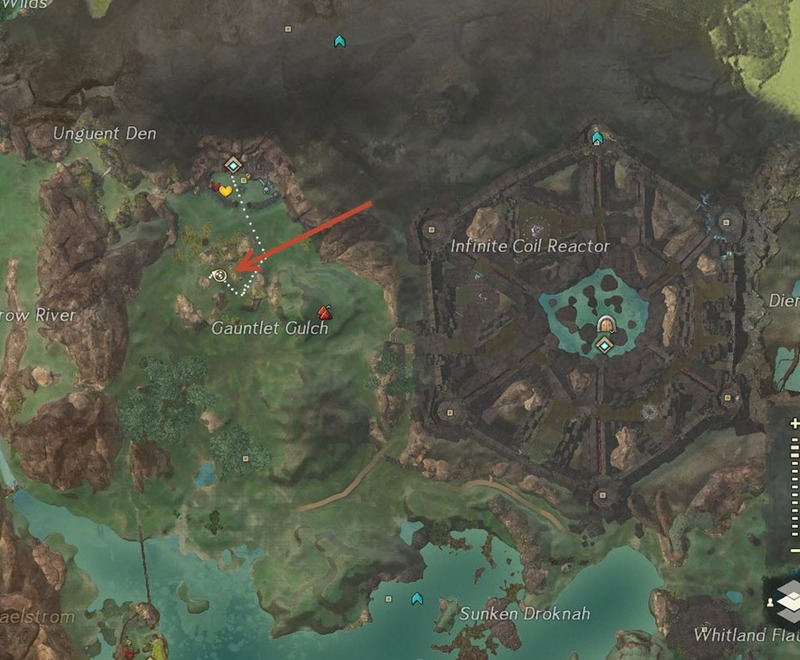 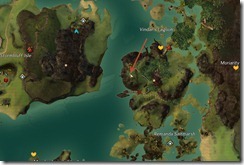 GW2 Chicken Scramble achievement guide with detailed walkthrough. 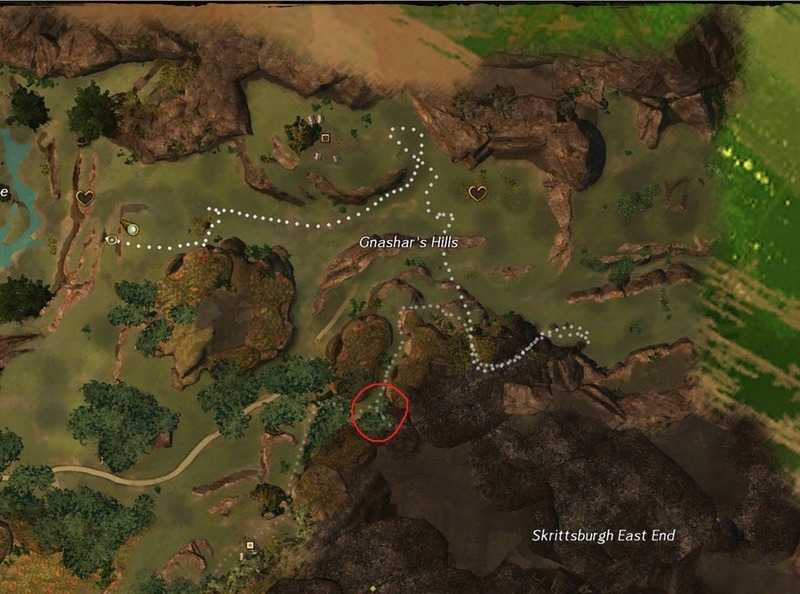 Chicken Scramble is an explorer achievement introduced with the Halloween patch for an achievement obtainable in Bloodtide Coast, Queensdale, Gendarran Fields and Kessex Hills. 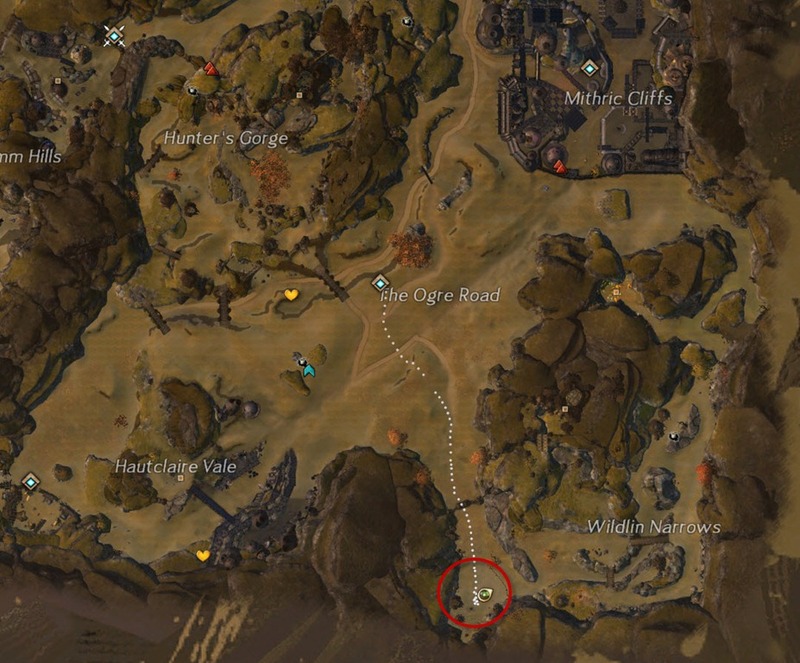 This one involves opening chests in these zones to spawn Skritt burglars that will transform you into a chicken for this achievement. 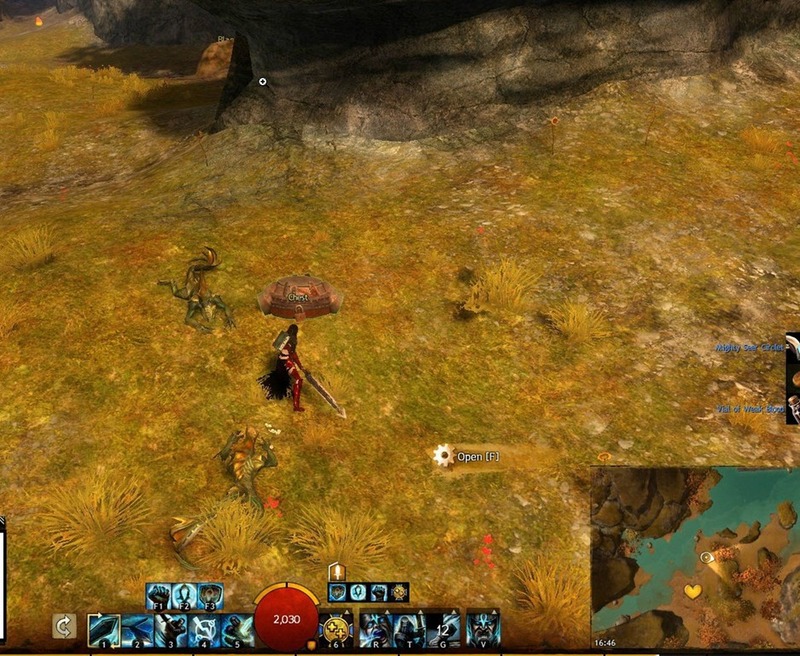 Like the other skritt burgler involving achievements, there isn’t one spot for the chest to spawn. 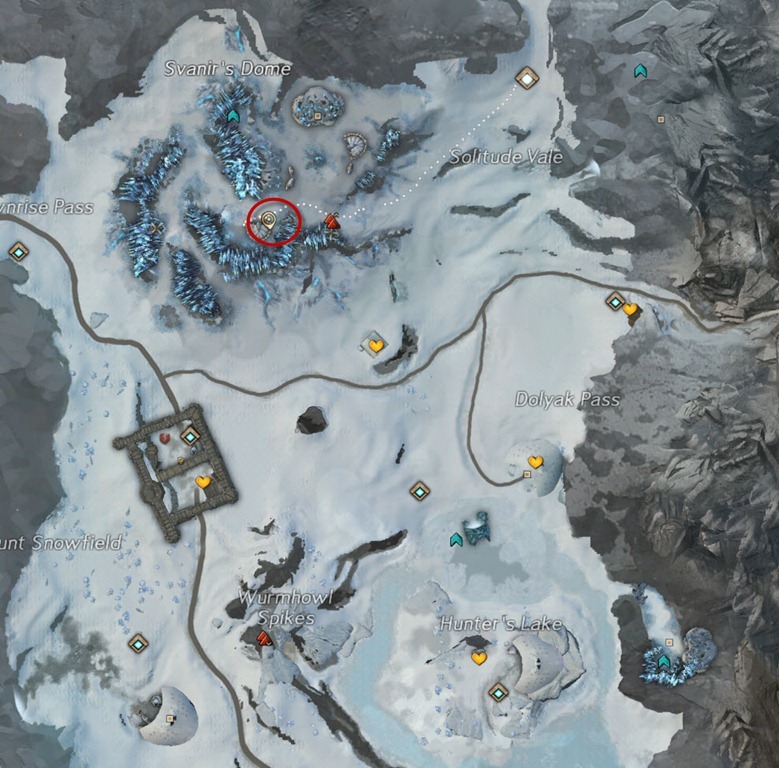 Instead, there are a number of possible locations. 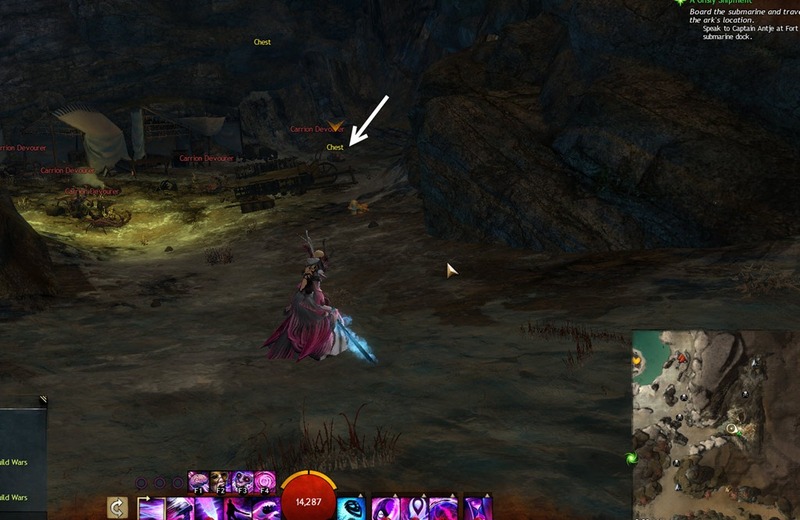 Press ctrl down while looking for these chests as it will highlight their names. 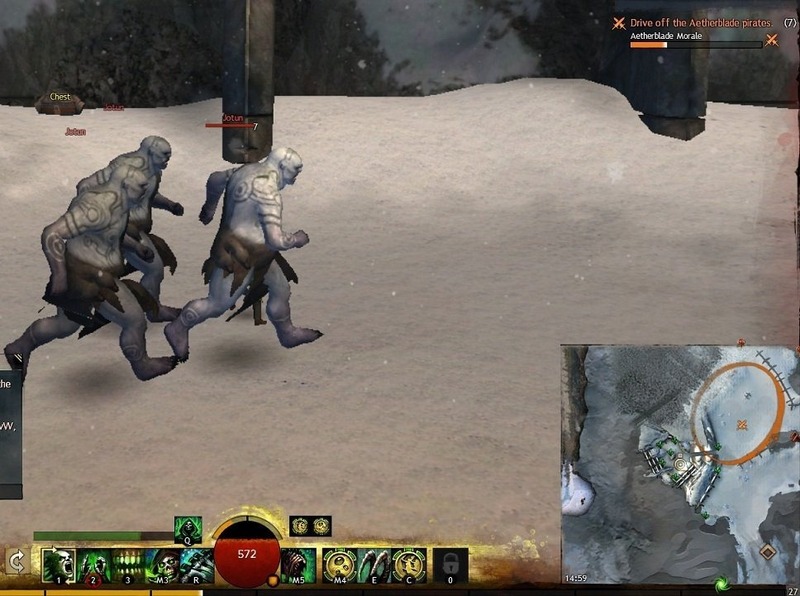 Do not use any pets/clones if possible as the skritt may transform your pet instead. 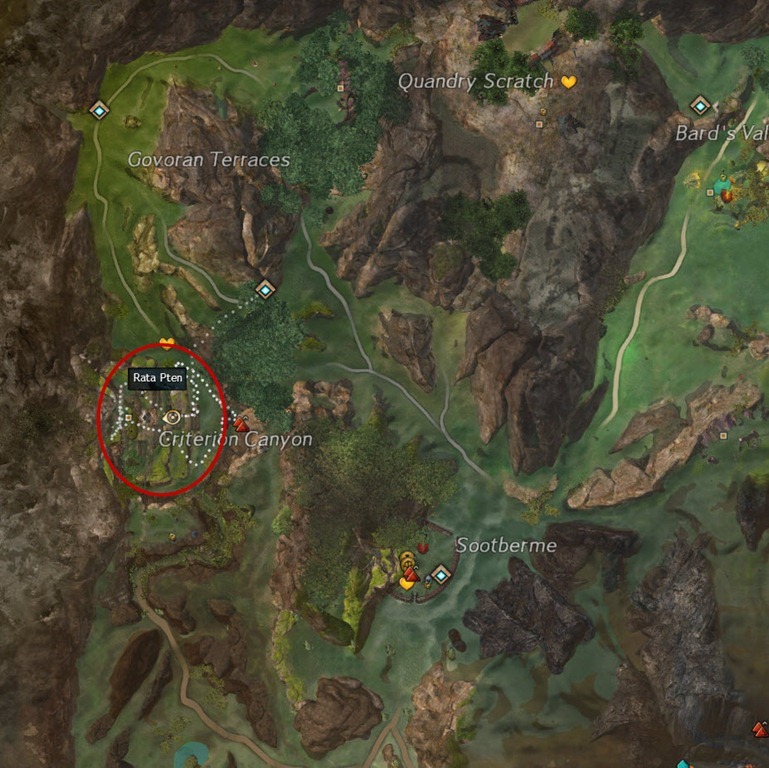 This is especially a concern for rangers. 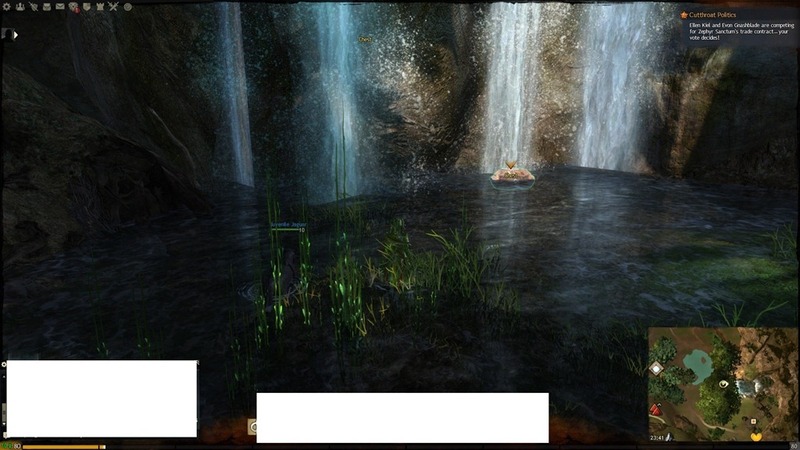 Image and location submitted by Rbn, note that the second image in German. 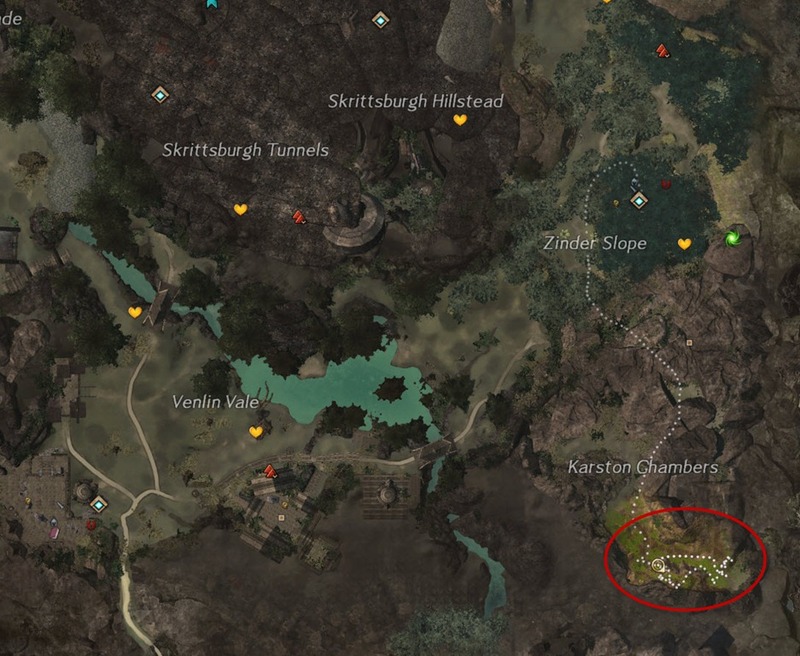 Reader L Ch F was able to locate a skritt burgler spawning chest below the bridge at the indicated location not far from LA entrance. 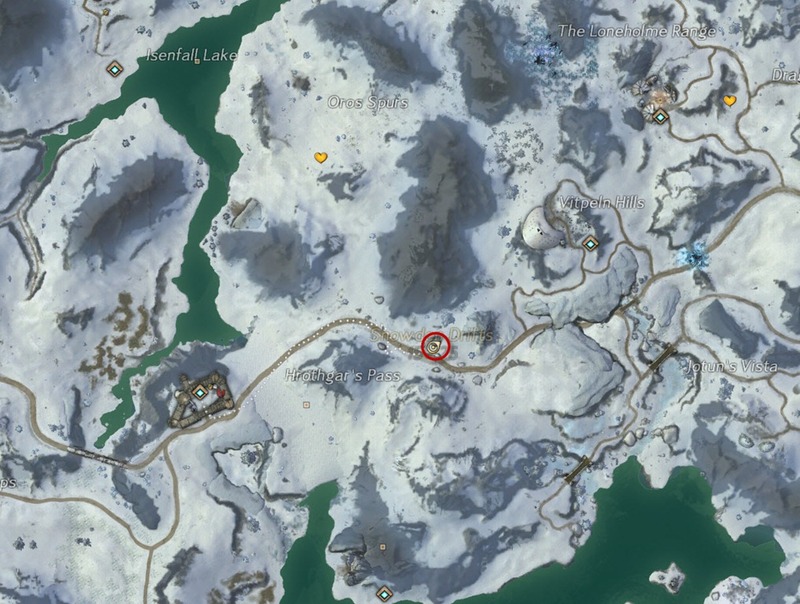 Thanks Theo for the verification. 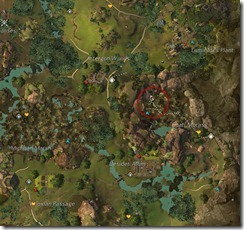 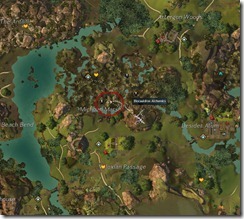 Check the entire camp, hold down ctrl to highlight any treasure chest nearby. 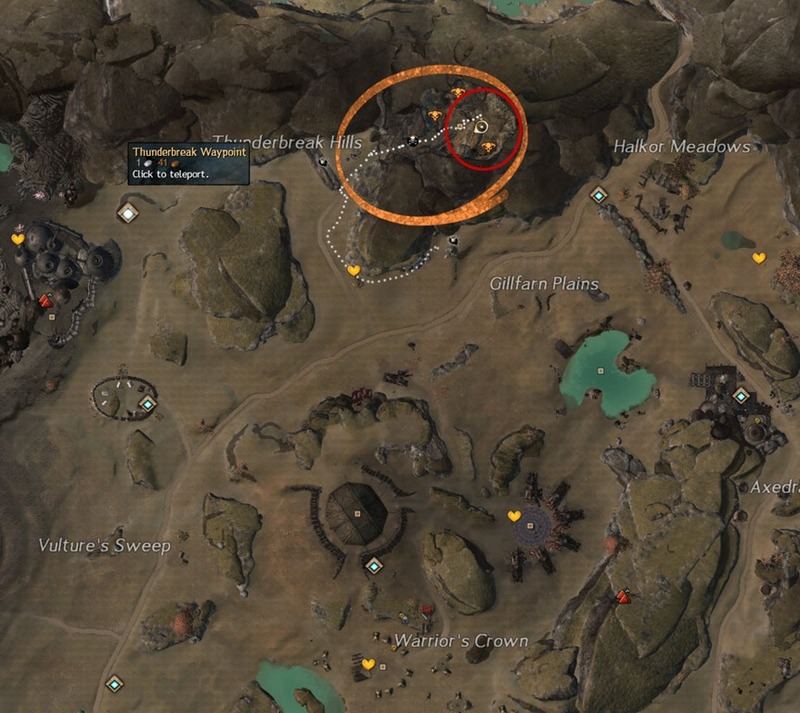 Submitted by Reader Omura Falk, this one is located on the SW corner of Gendarran Fields. 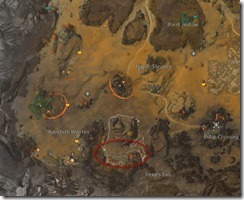 See Halloween Patch Explorer achievements guide for other achievements. 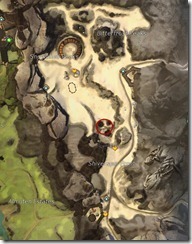 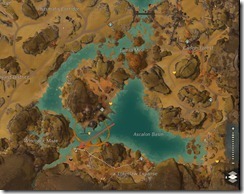 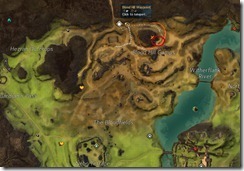 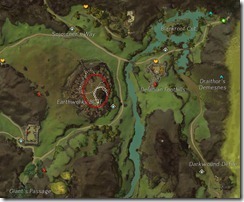 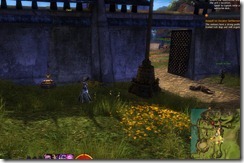 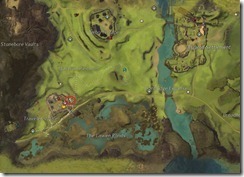 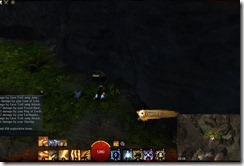 GW2 Behind the Mask achievement guide with detailed walkthrough. 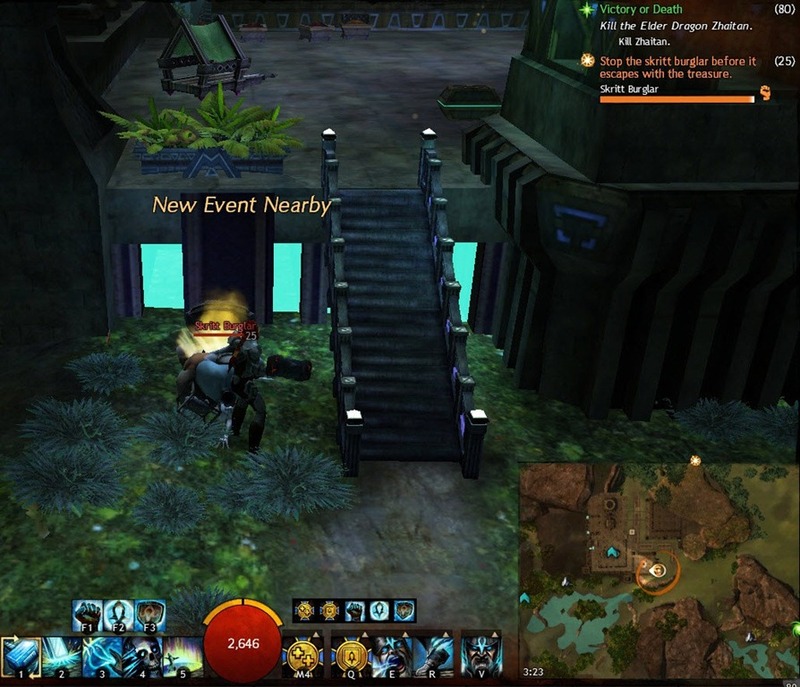 Behind the Mask is an explorer achievement released with the new Halloween patch. 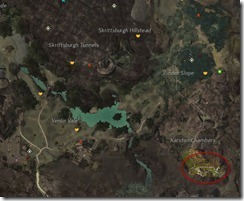 It is also a skritt burglar/treasure chest related achievement and therefore will have a number of possible locations within the zone. 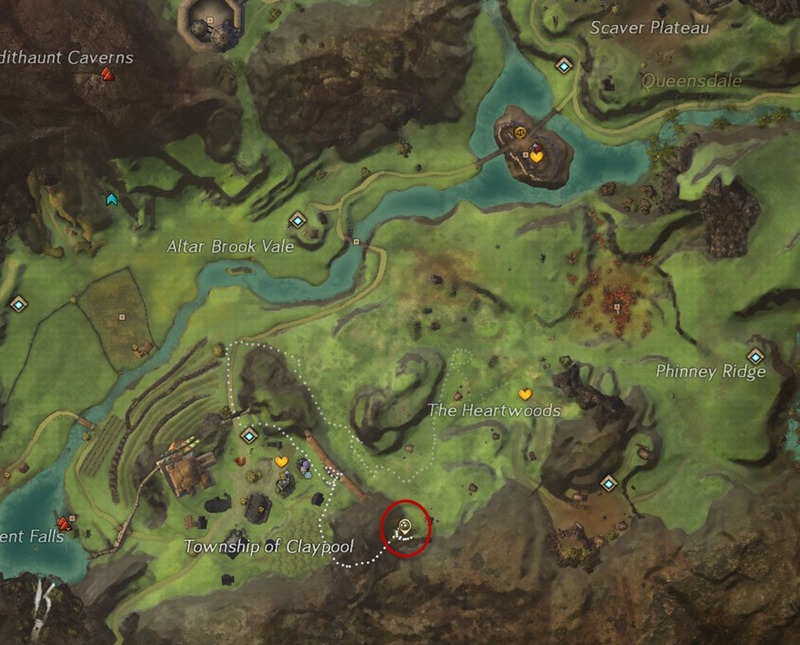 For this achievement, you will want to look for chests in Plains of Ashford, Diessa Plateau, Fireheart Rise and Fields of Ruin. 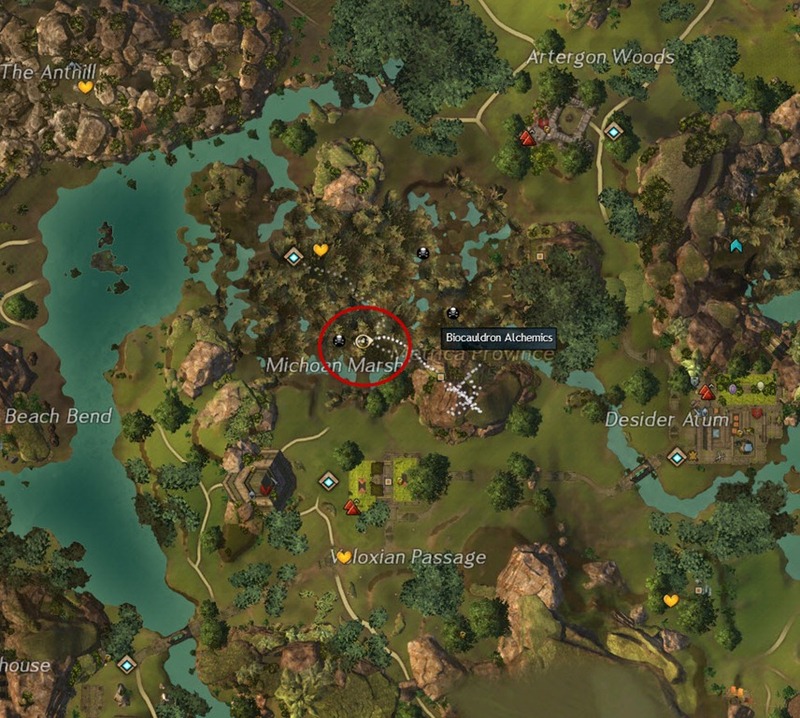 Location submitted by reader/redditor Ayesafaile, I was also able to get the achievement at this location. 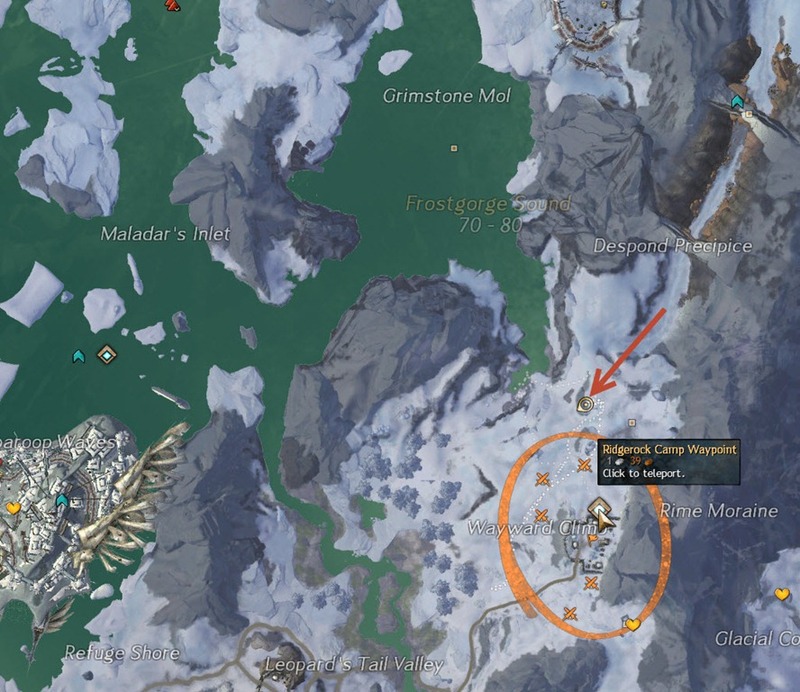 Redditor Kholdy found another possible location for the chest. 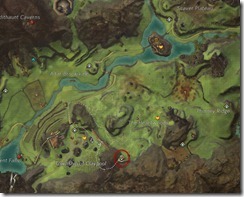 This one is in SE Plains of Ashford. 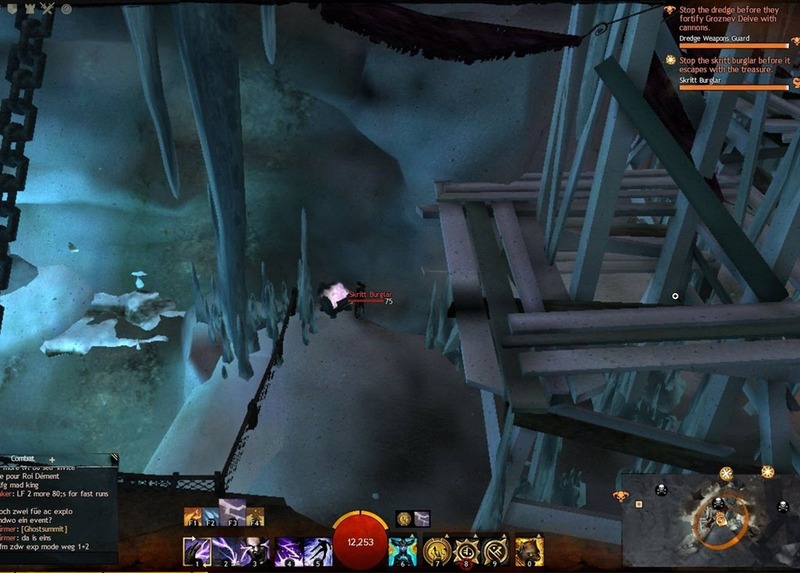 Submitted by anonymous reader and Vertigo.NE of Ascalonian Catacombs entrance there is a tunnel with two ghosts (one veteran) at the end that will chat for a bit before attacking you. 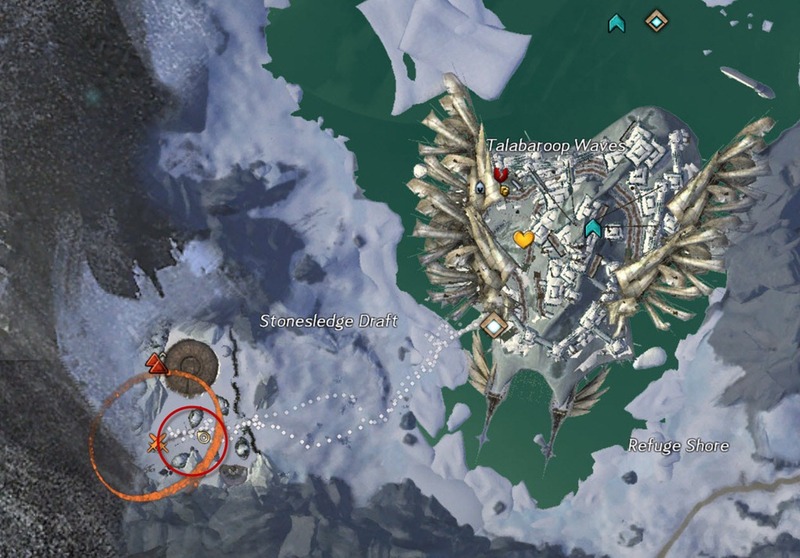 This tunnel might contain a chest. 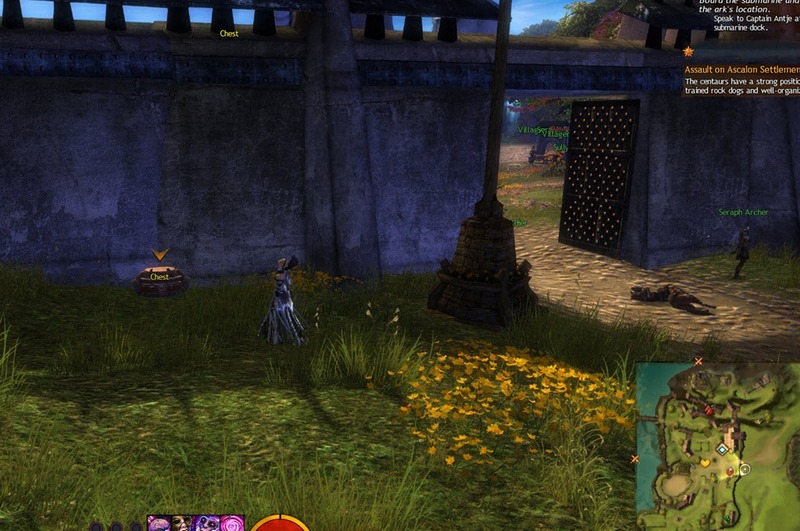 Reader Nickchanger found a chest at this location on the SW portion of Plains of Ashford. 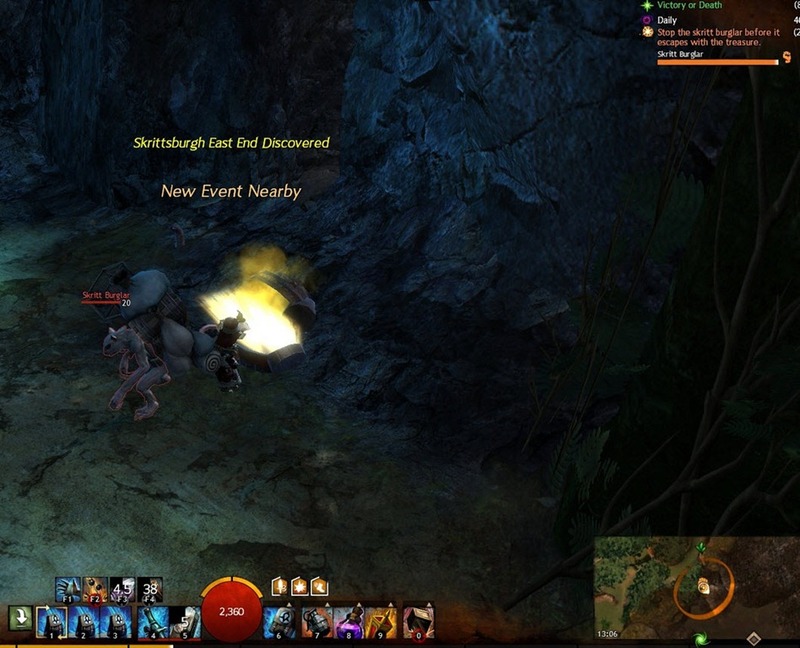 Reader Stoon and Xewell found the chest at this location on the NW portion of Fireheart Rise. 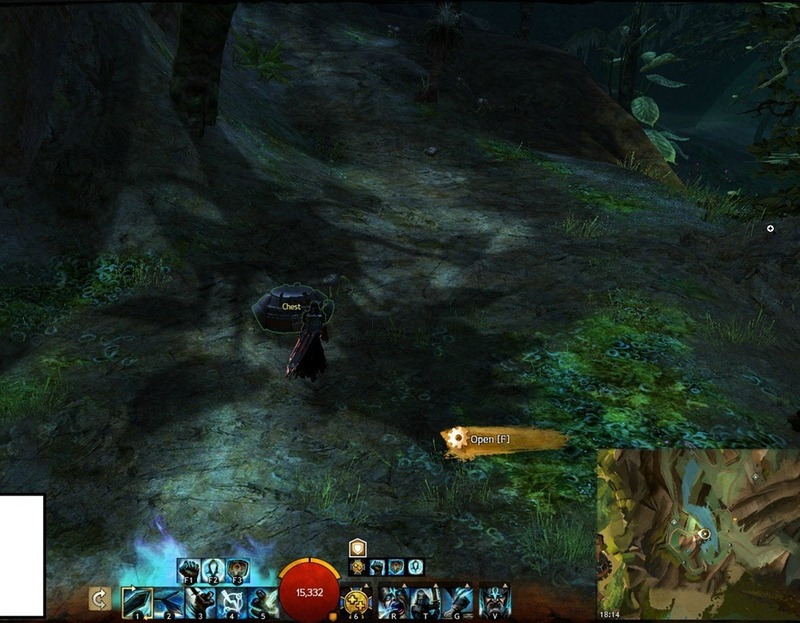 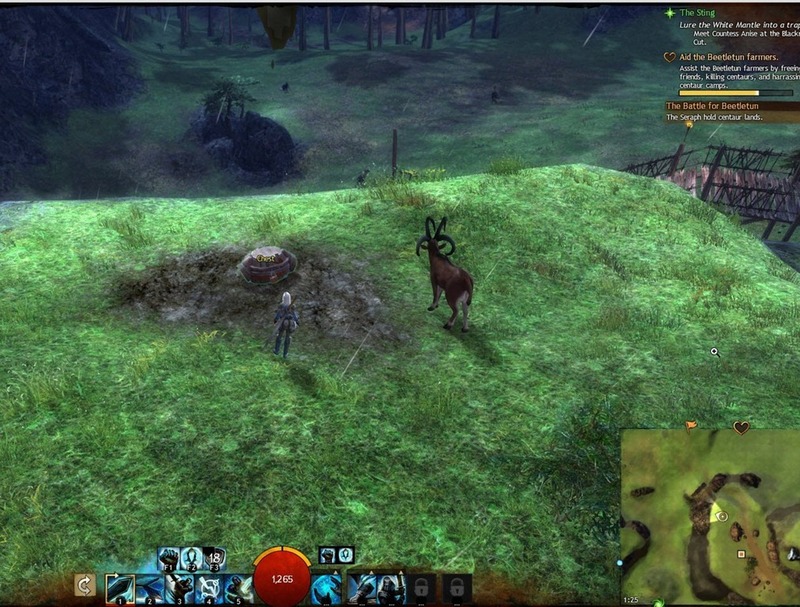 Reader Nameo found this chest in Fireheart Rise. 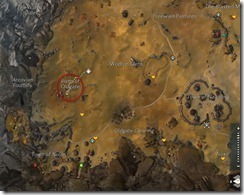 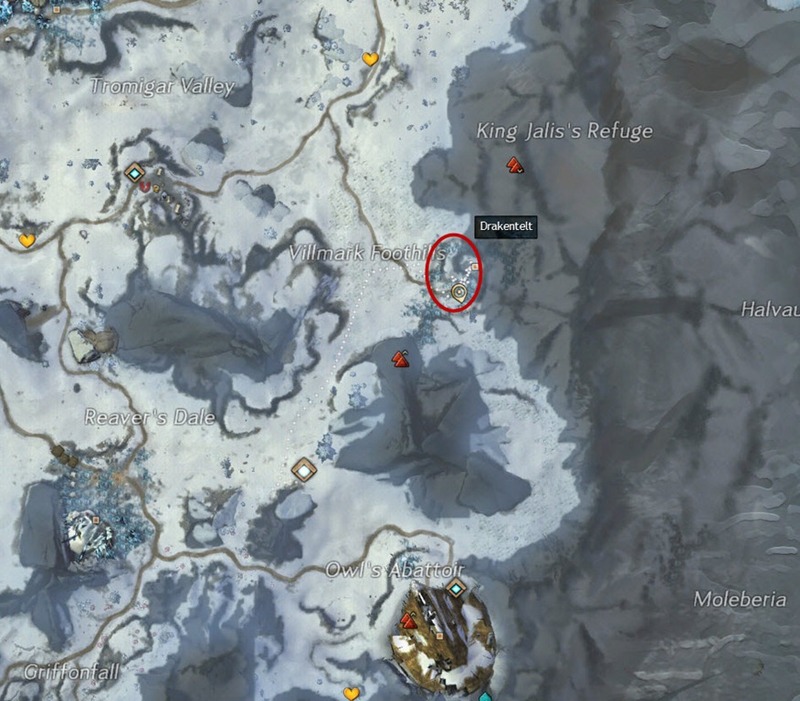 GW2 A Waddle to Remember achievement guide with detailed walkthrough. 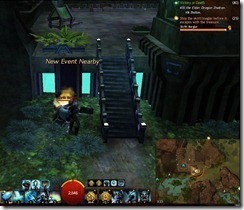 A Waddle to Remember is an explorer achievement introduced with the Halloween patch. 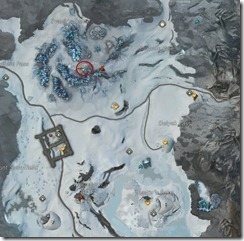 Like the other skritt transformation related achievements, this one has a number of possible locations. 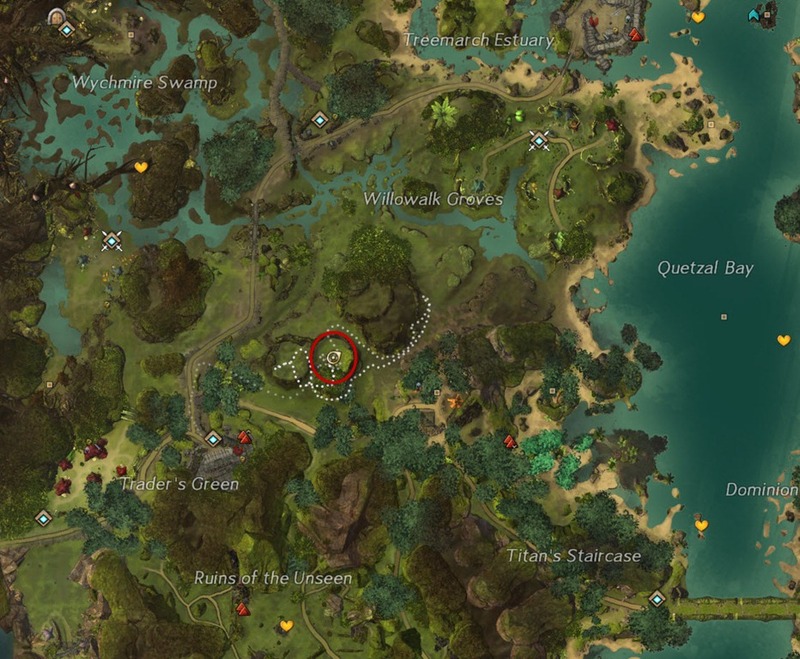 At the moment this achievements seems to be obtained from chests located in Mount Maelstrom, Brisban Wildlands, Caledon Forest, and Metrica Pronvince (i.e. 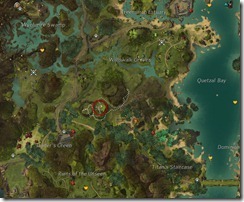 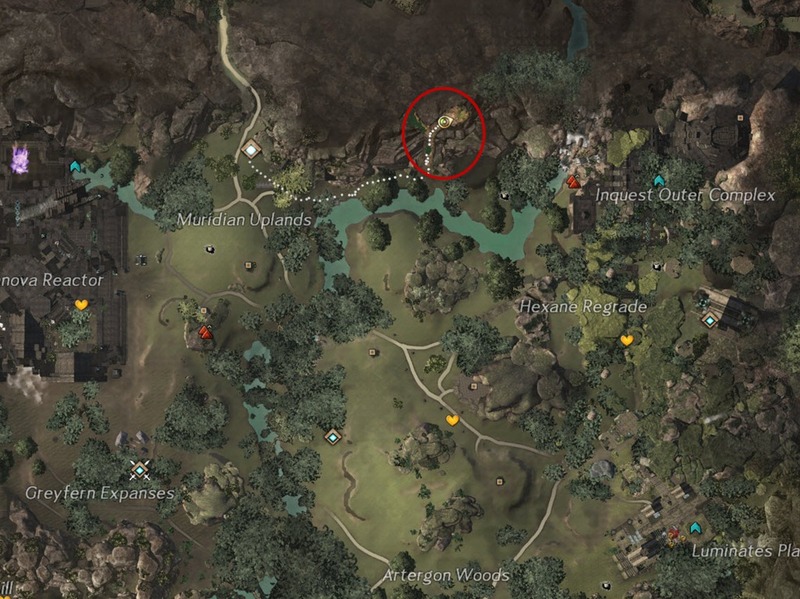 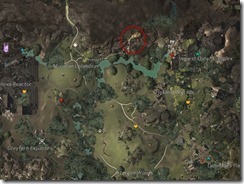 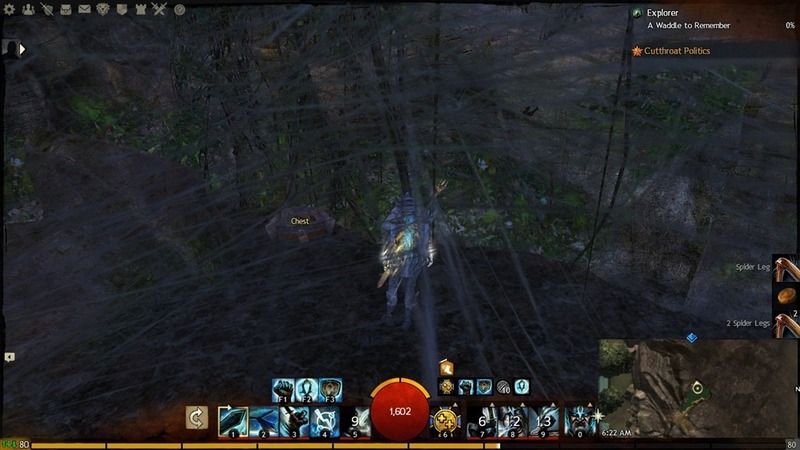 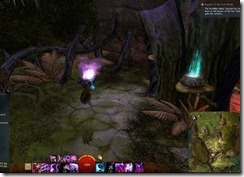 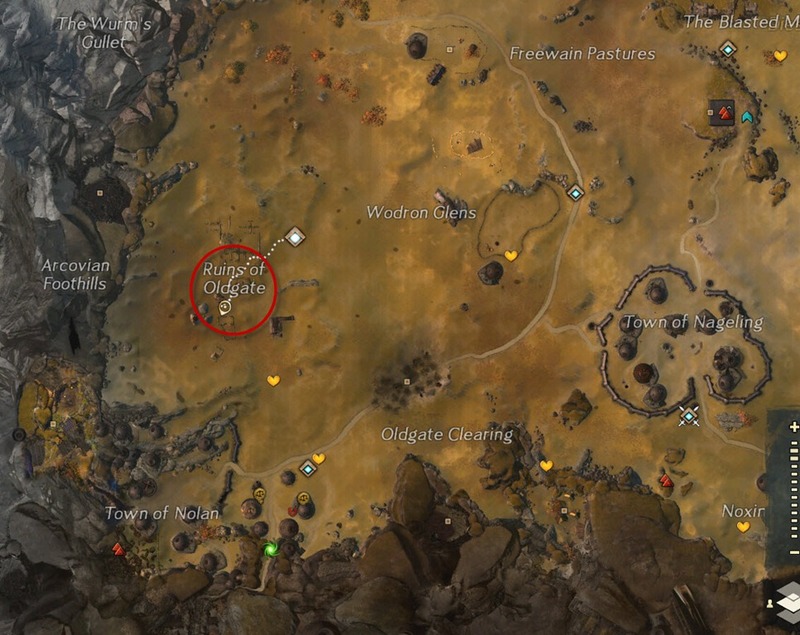 Maguuma Jungle area)..
Reader/Redditor swifterc reported a skritt burglar poping chest at the following location. 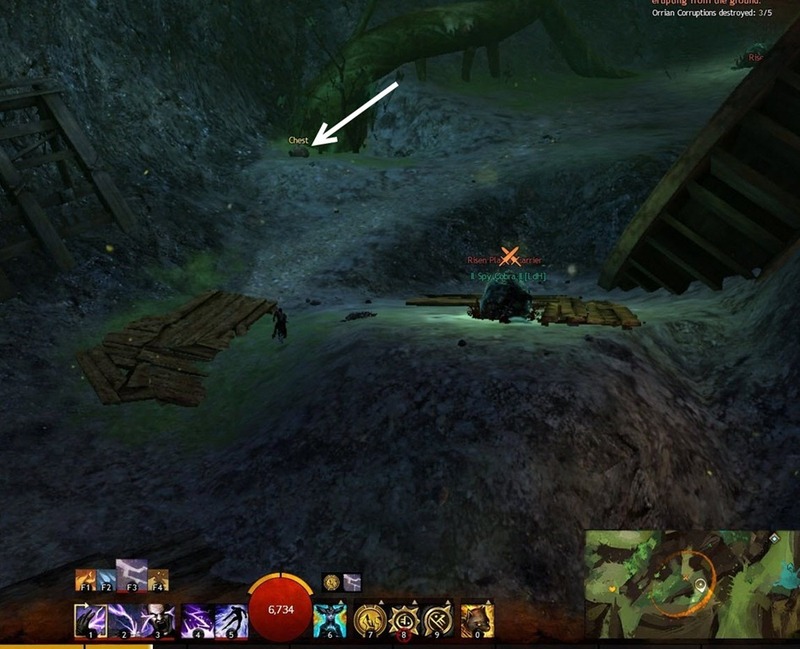 Redditor Kholdy found another location for the skritt burglar spawning chest. 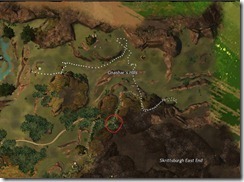 Check the trees along the Broken Arrow River. 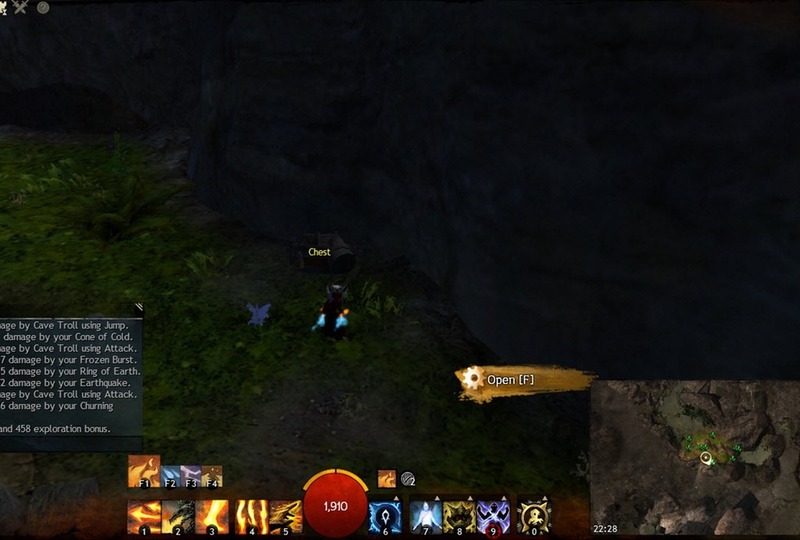 While running around, hold down ctrl key to help highlight the chest if it exists.Thanks Theo for the verification. 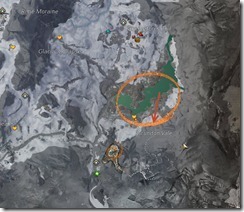 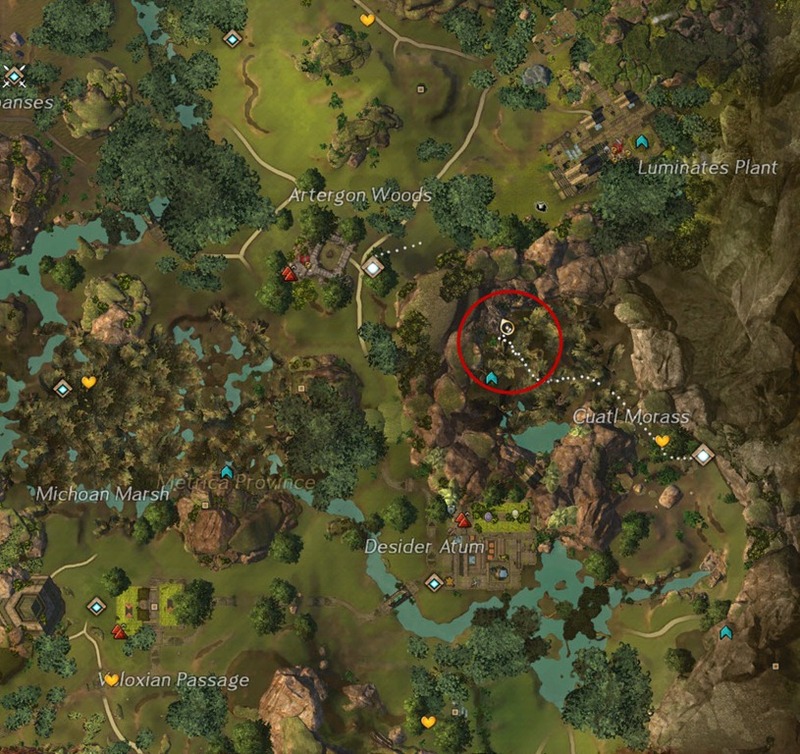 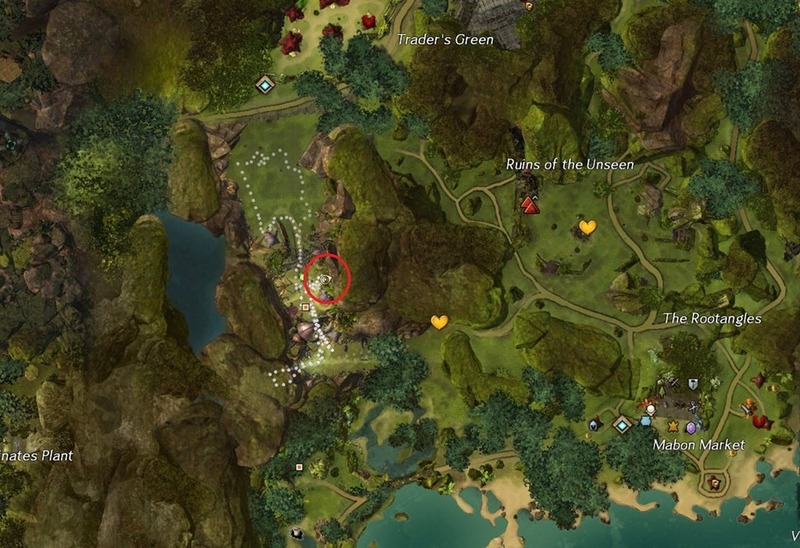 Check the area around Rata Pten POI on the NW corner of Mount Maelstrom, hold down ctrl key while searching to see if there is a chest nearby. 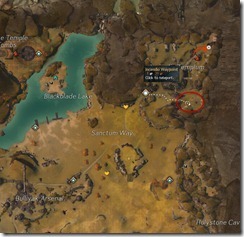 Check the group of Inquest mobs NW of Biocauldron Alchematics. 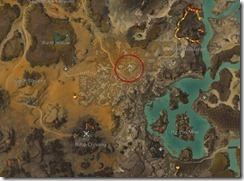 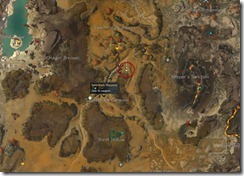 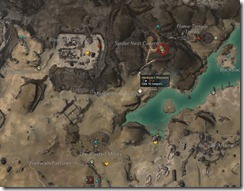 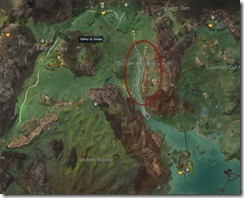 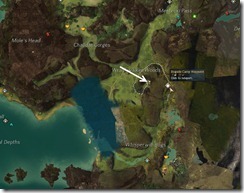 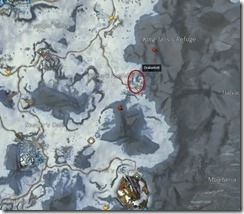 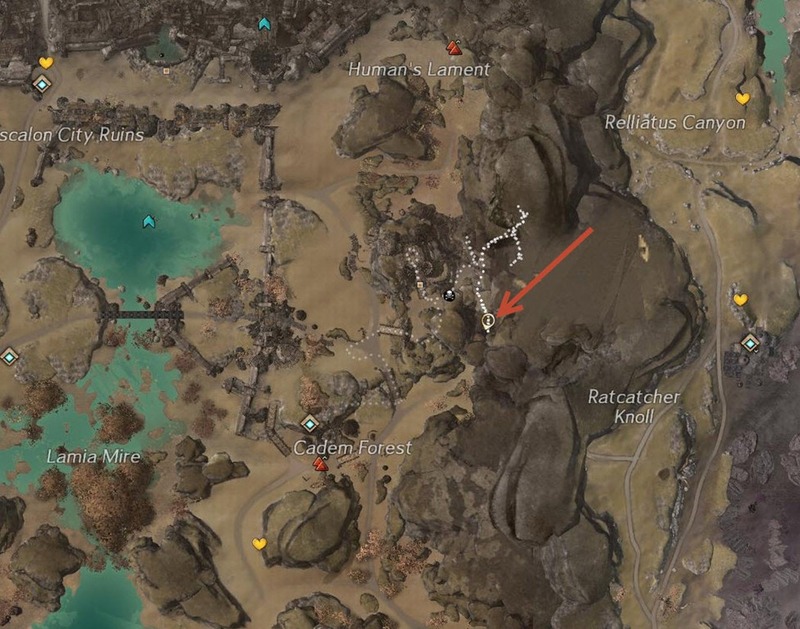 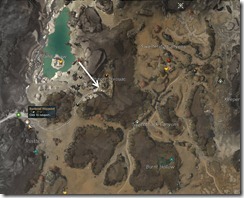 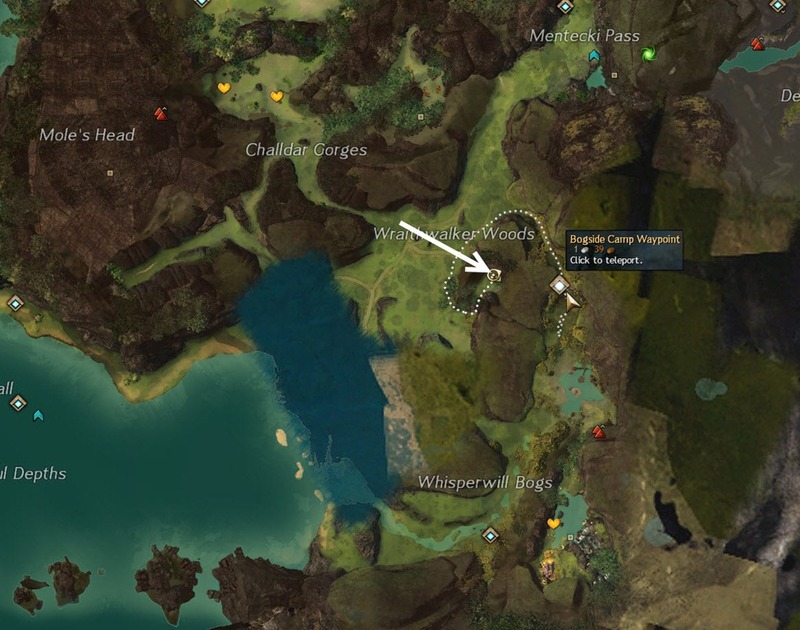 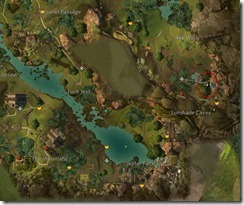 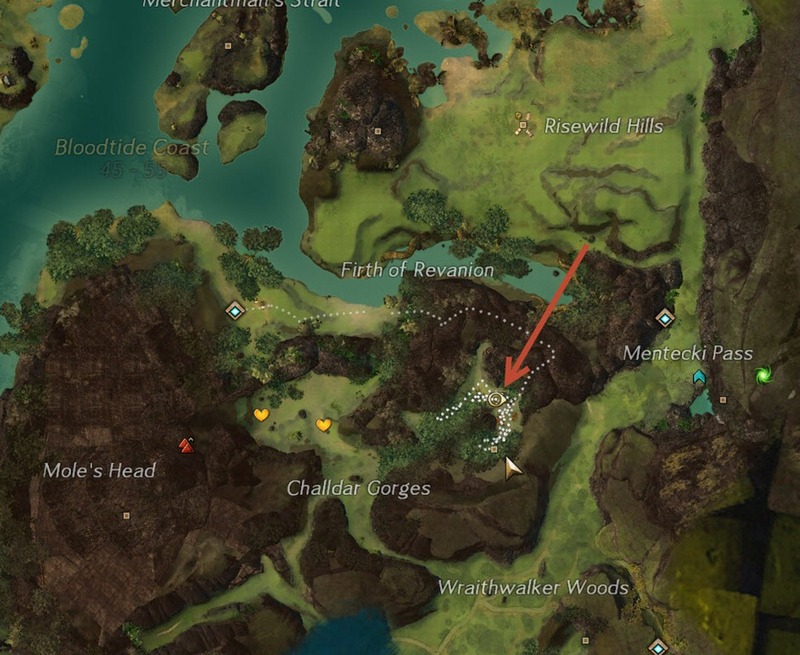 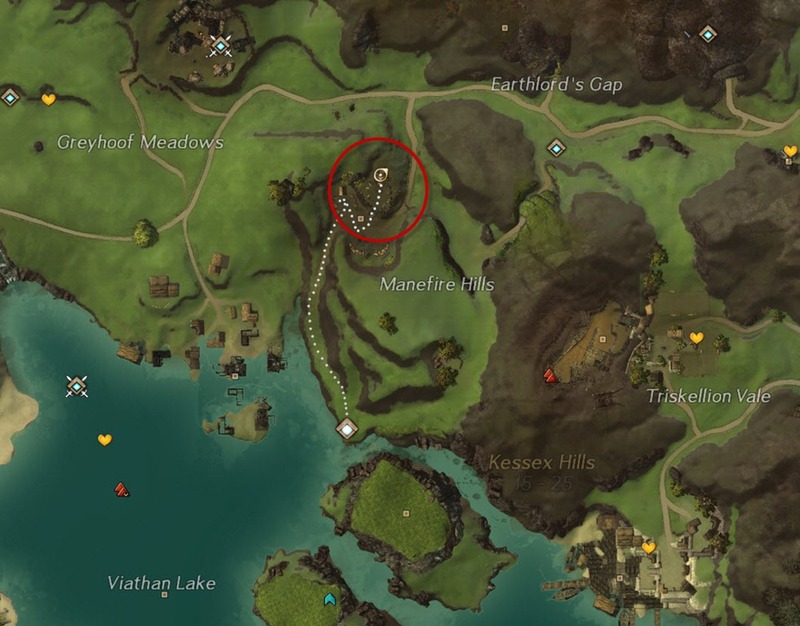 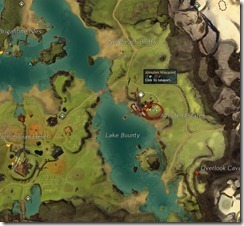 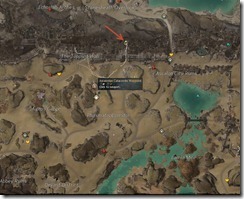 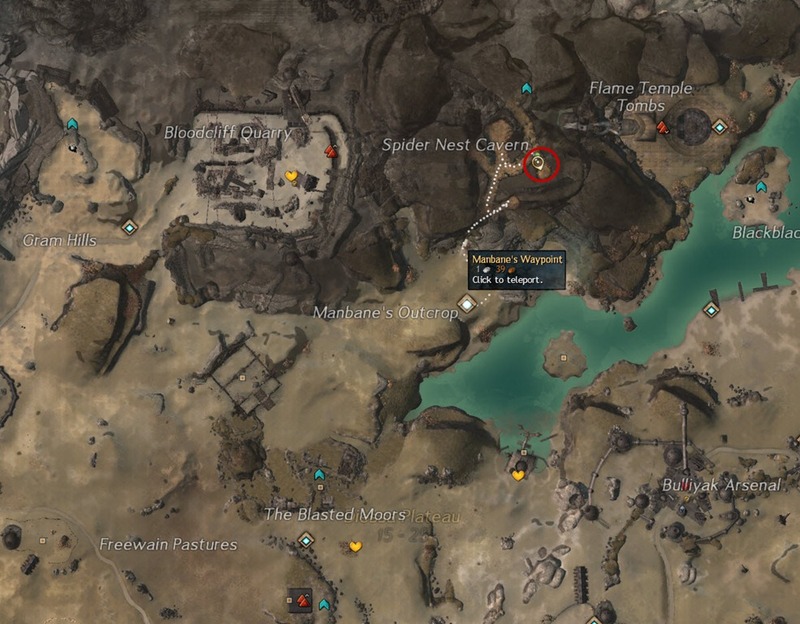 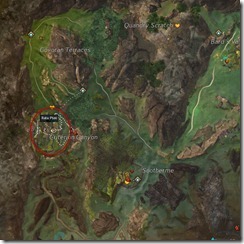 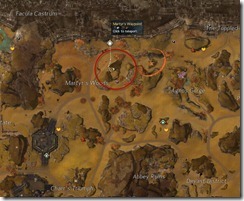 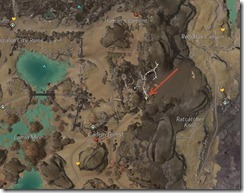 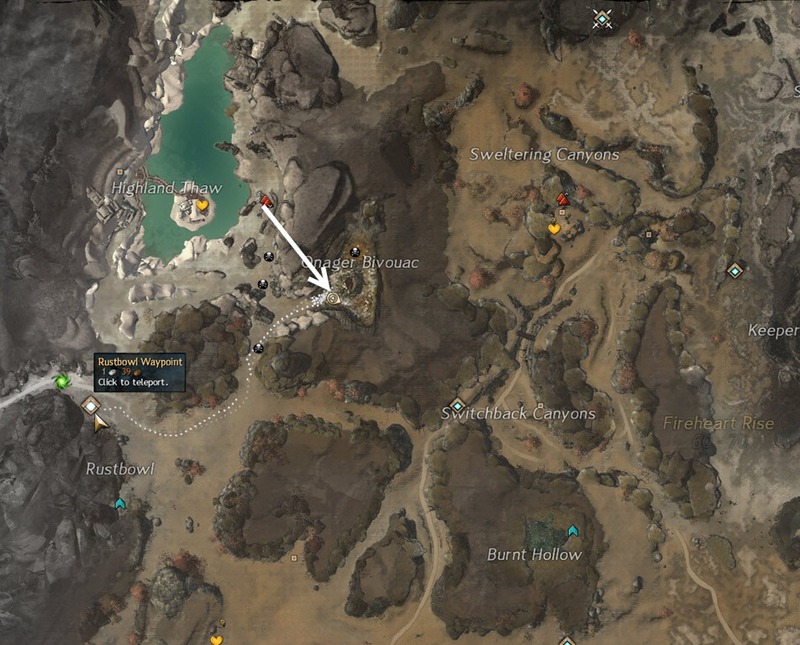 GW2 GW2 Magellan’s Memento achievement guide with detailed walkthrough. 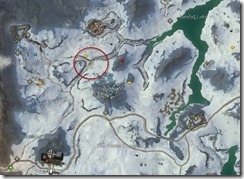 Magellan’s Memento is a new explorer achievement obtained with the Halloween patch and is located on the SE corner of Frostgorge Sound. 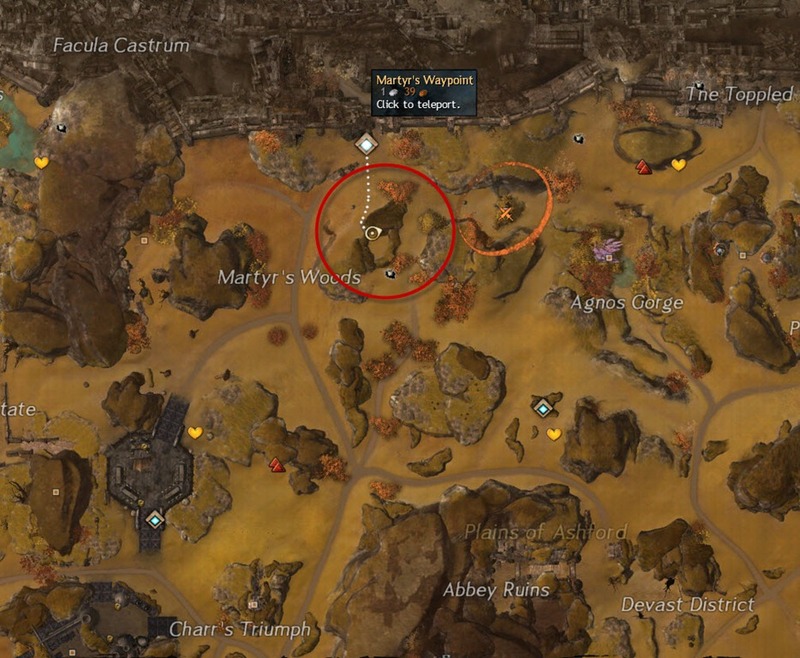 This achievement is fairly short and can be obtained solo if you are good at dodging red circles and can skip mobs. 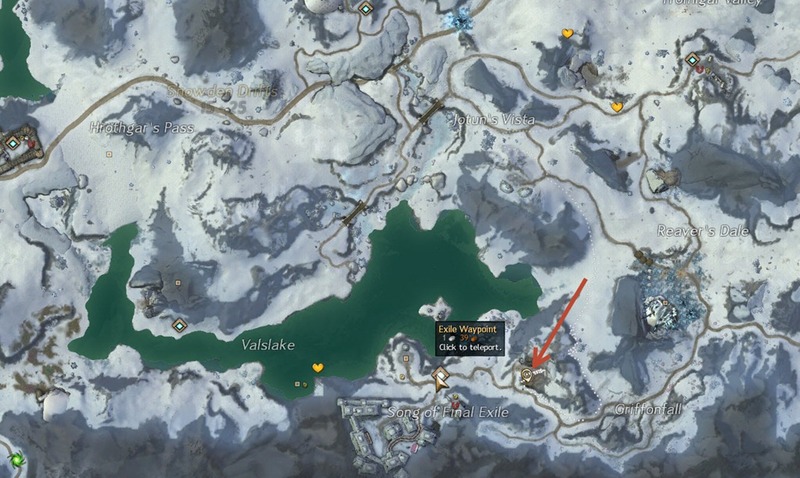 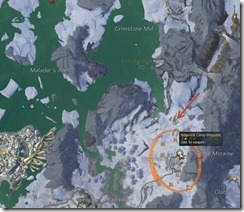 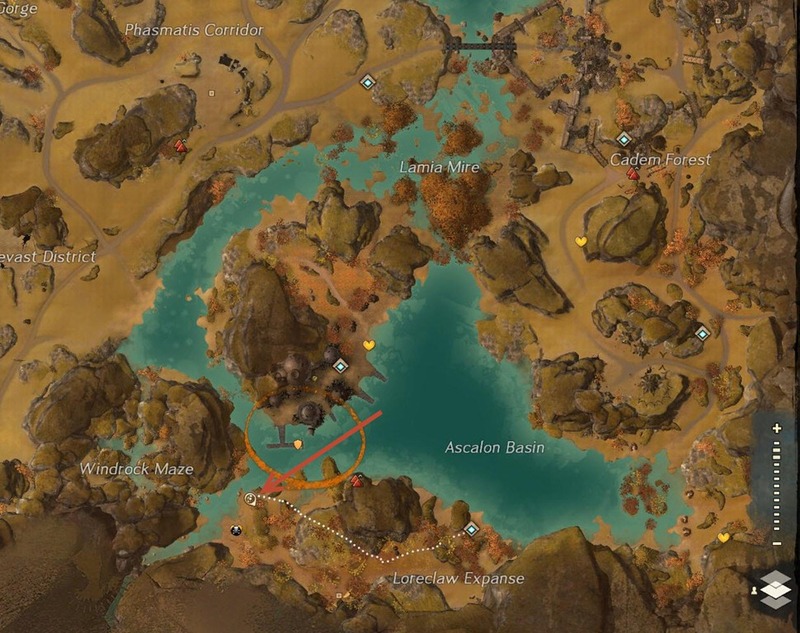 Take the Arundon Waypoint at SE corner of Frostgorge Sound. 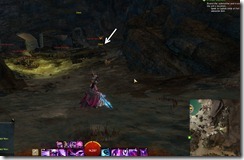 From here, head NE towards the heart and then go SE once you reach the heart and look for a cave entrance. 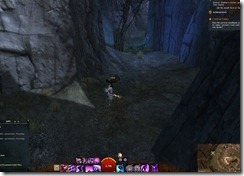 Inside is a series of long tunnel with a couple of grawls. 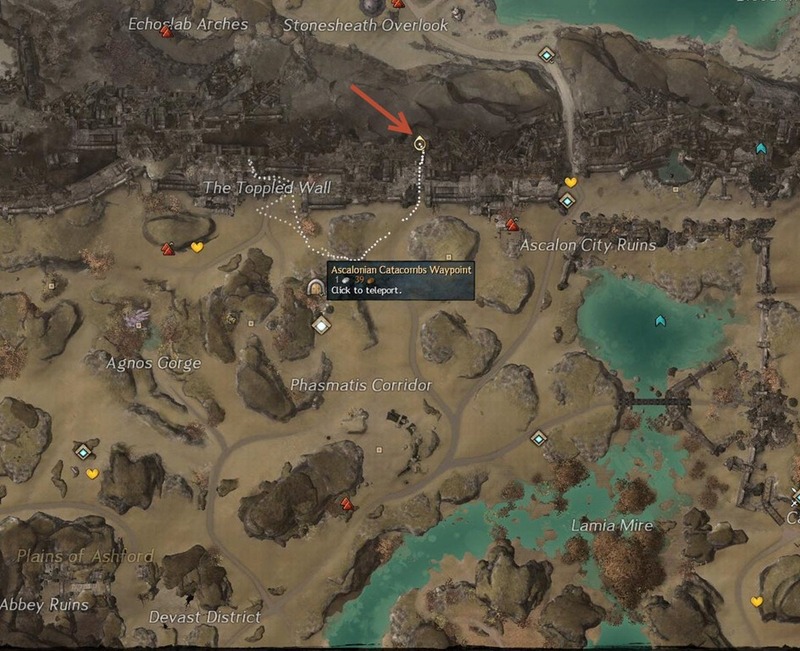 These grawls can be skipped and most likely won’t kill you. 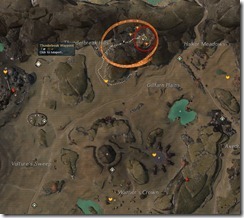 What you do have to watch out however, is the red circles on the ground. These red circles can almost instantly down you if you don’t dodge out of them. 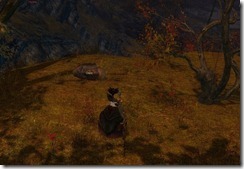 Pretty soon, you will see Tattered Journals scattered on the ground. 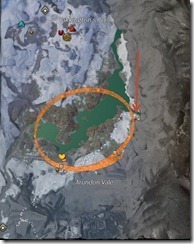 There are three volumes in total and the other two volumes can be obtained at the end. 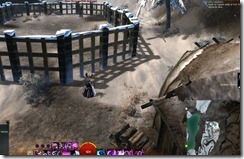 You will need to defeat two veteran grawls guarding a makeshift gate to proceed further in the tunnel. 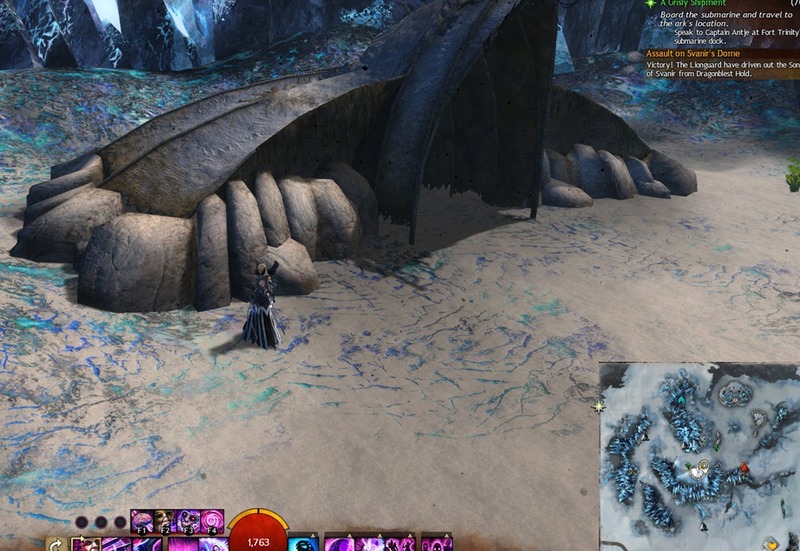 At the end of the tunnel is a champion Giant Blue Ooze guarding a chest. 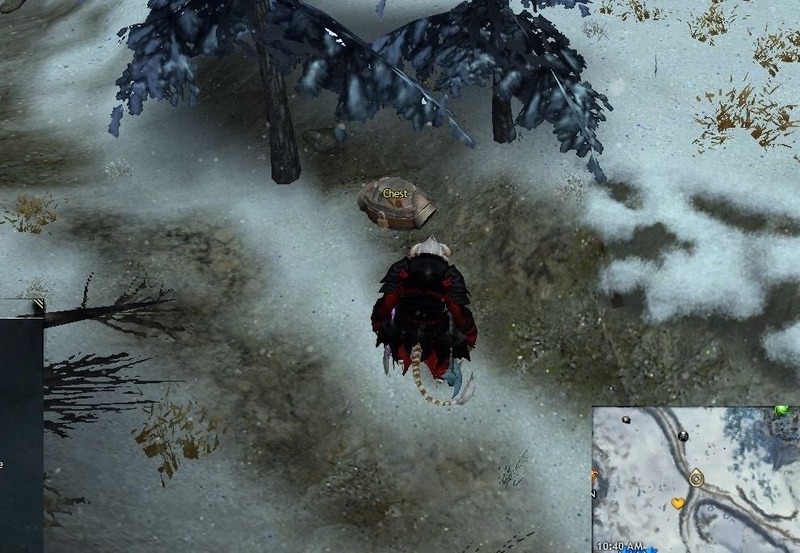 Running towards will grant you the achievement! 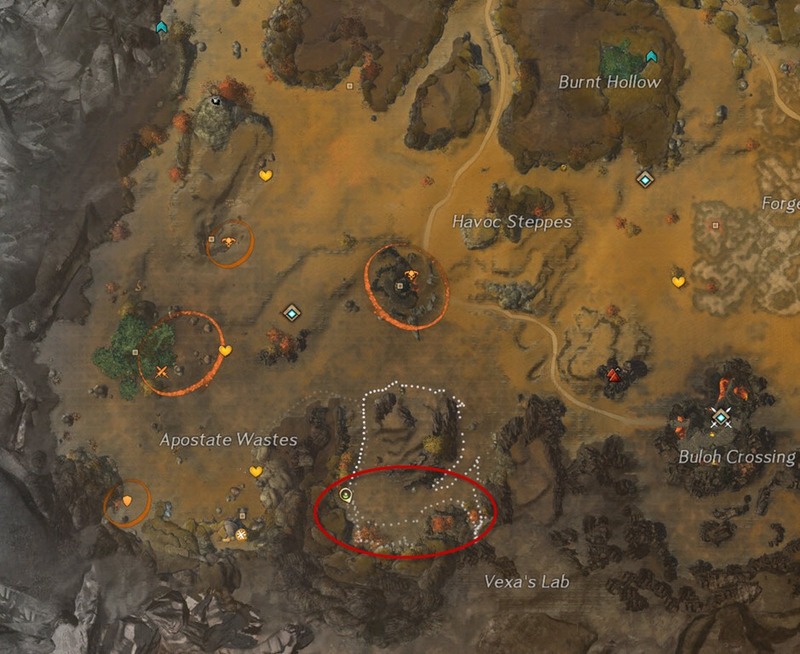 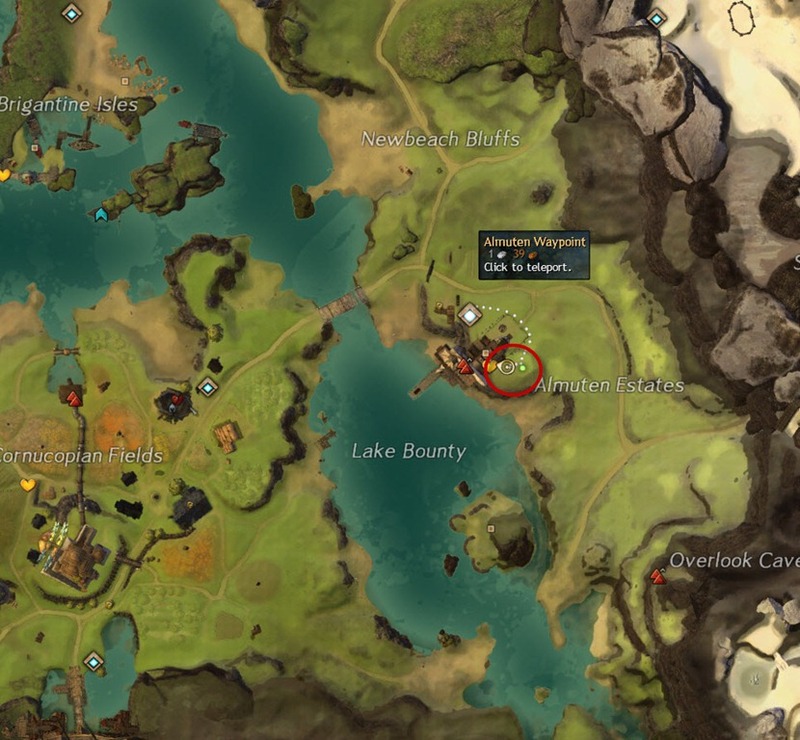 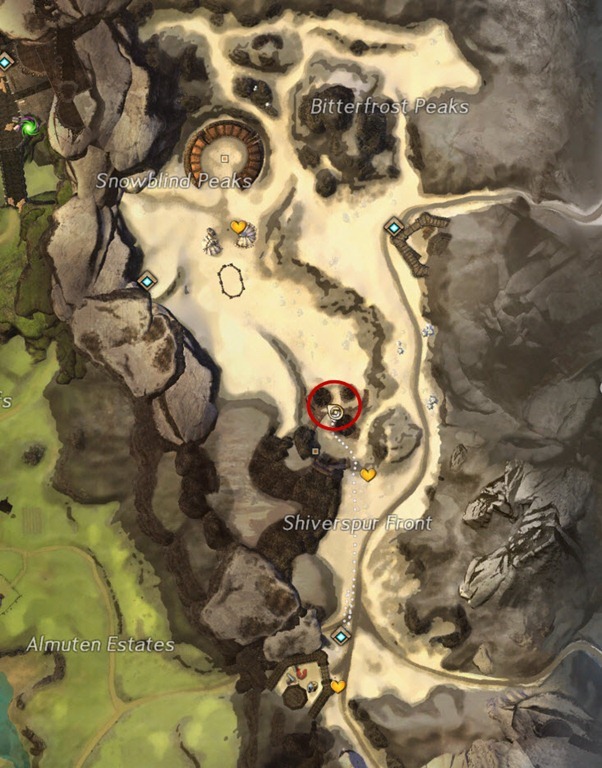 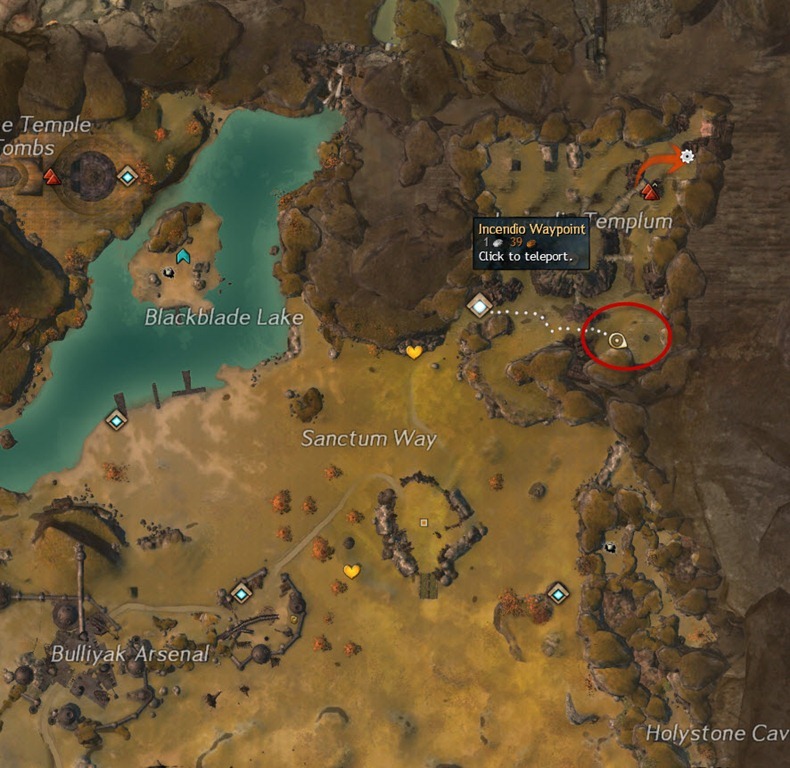 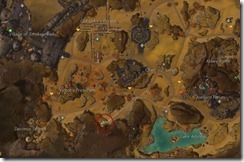 GW2 Jackaloping Along achievement guide with detailed walkthrough. 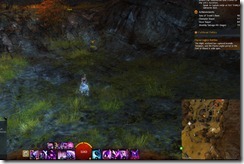 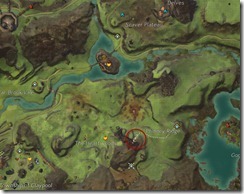 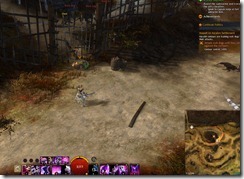 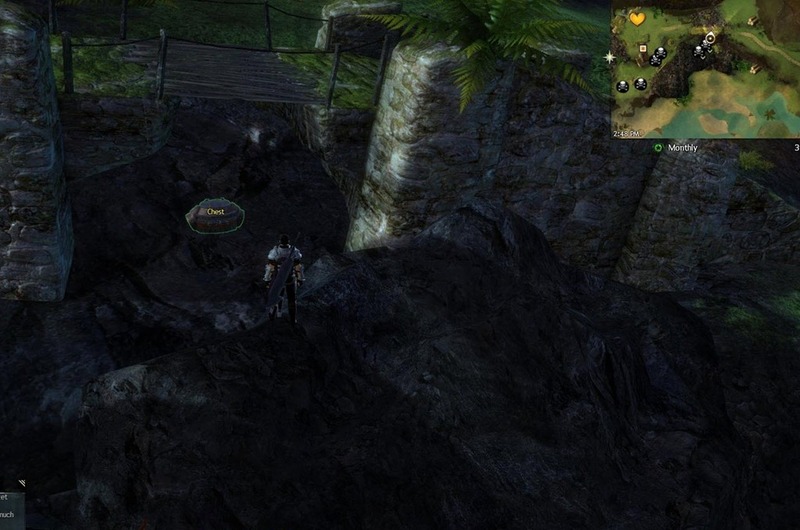 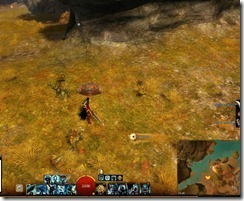 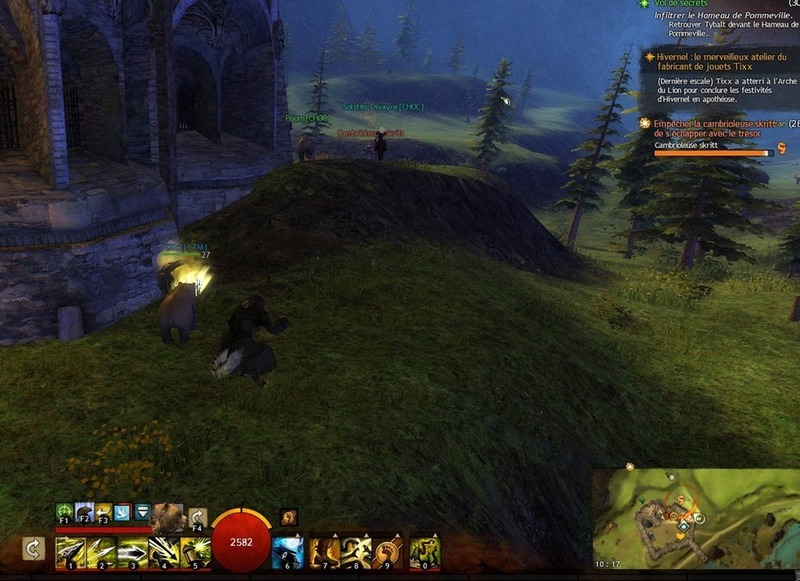 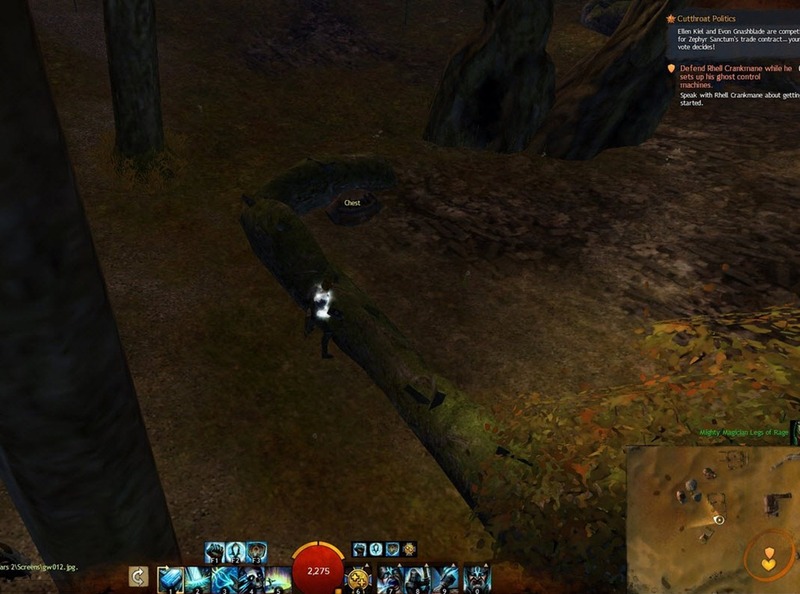 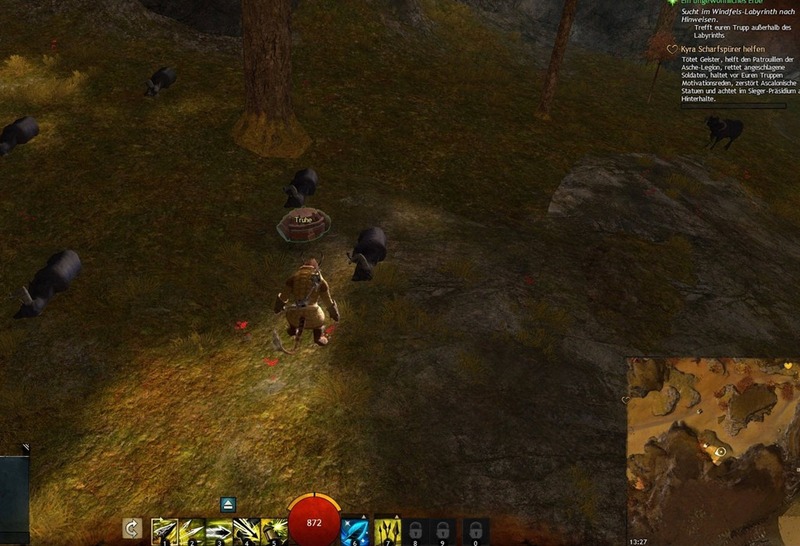 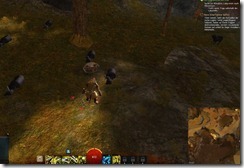 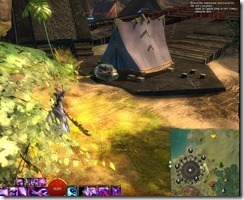 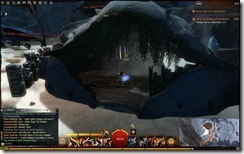 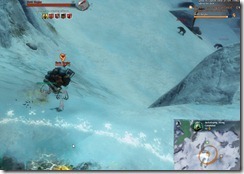 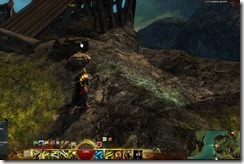 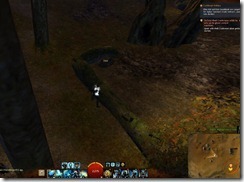 GW2 Jackaloping Along is an explorer achievement added with the Halloween patch. 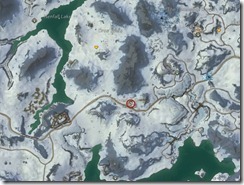 This achievement can be obtained in Frostgorge Sound, Snowden Drifts, Wayfarer Foothills and Lornar’s Pass . 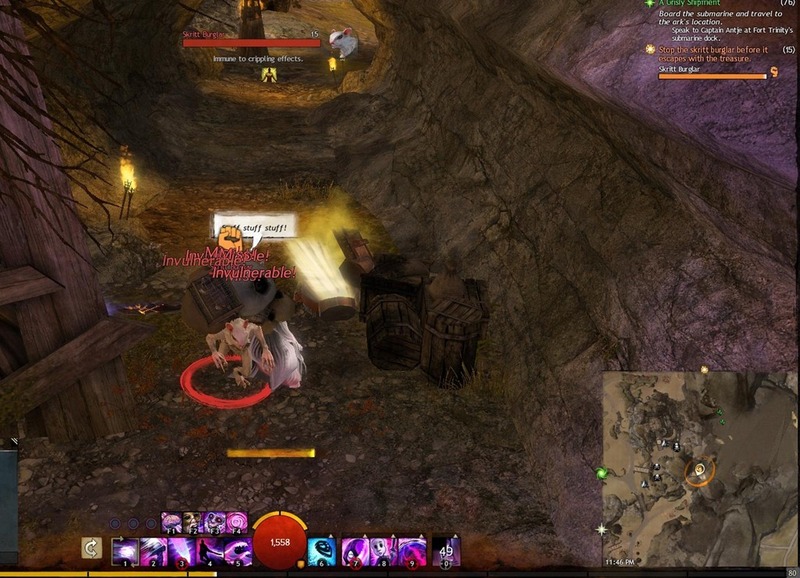 Note that this achievement involves a treasure chest that spawns a skritt burglar. 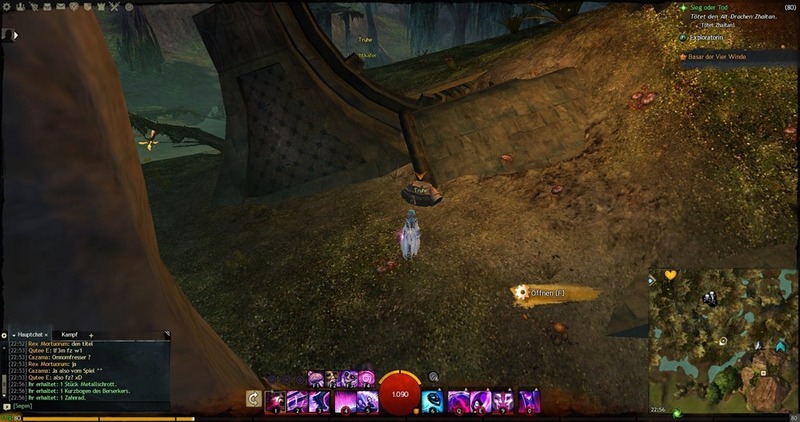 The chest disappears if someone else has recently looted it and moves to another location. 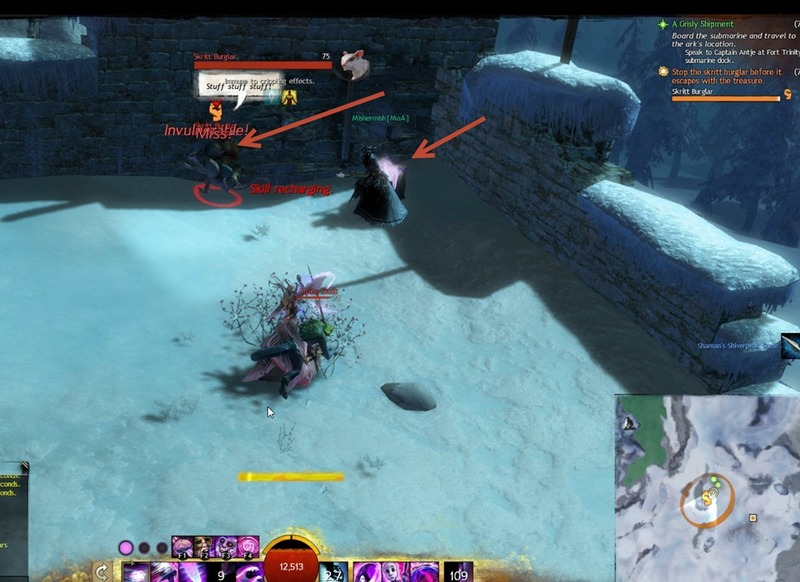 Focus on low damage attacks so you don’t kill the skritt burgler too quickly. 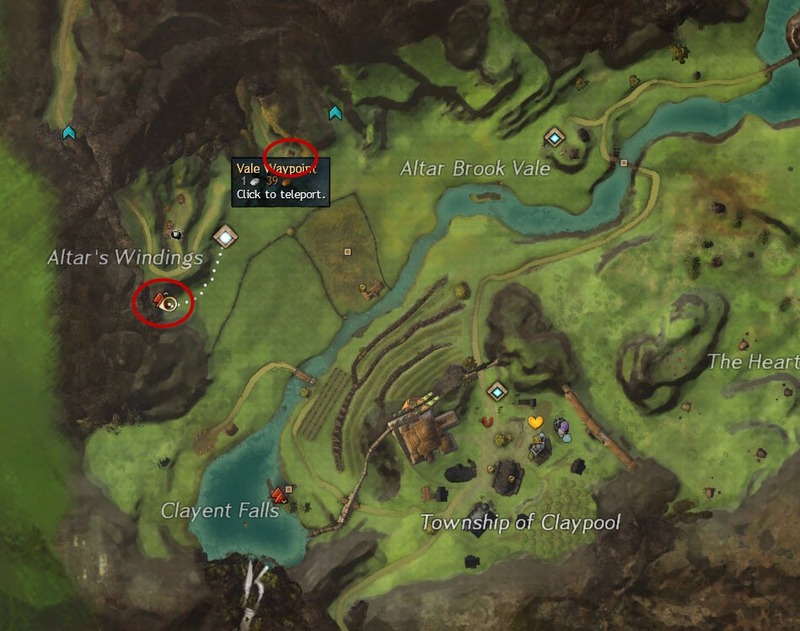 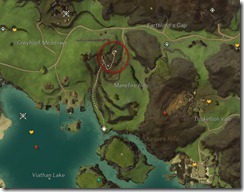 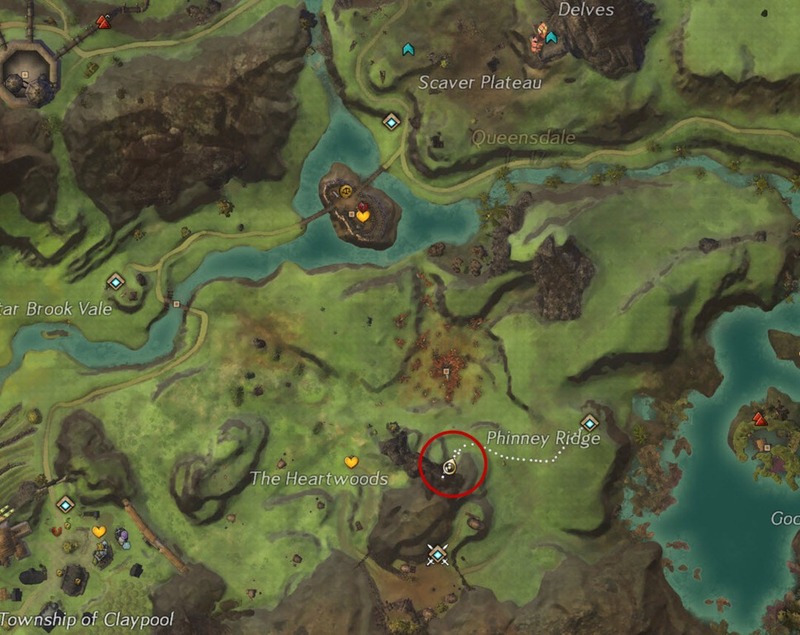 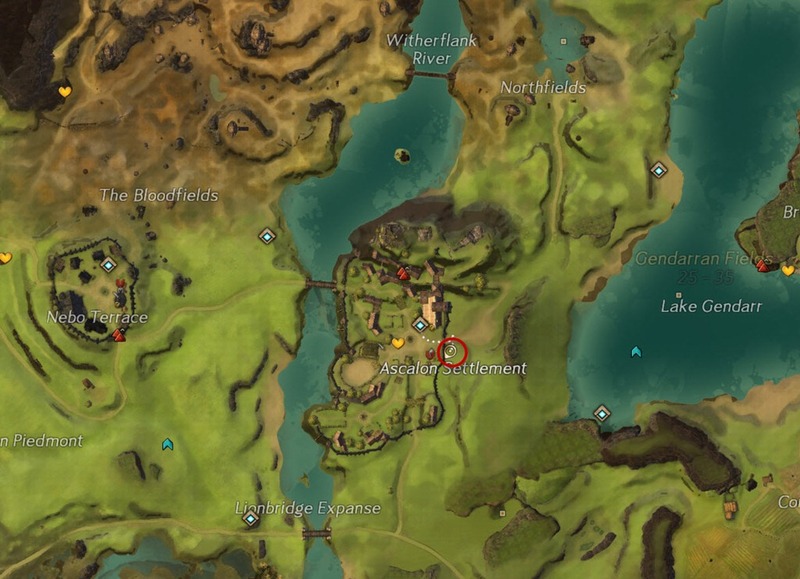 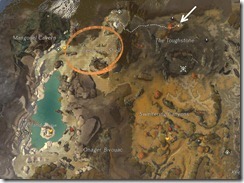 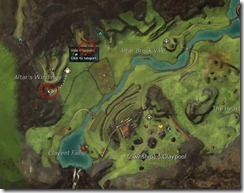 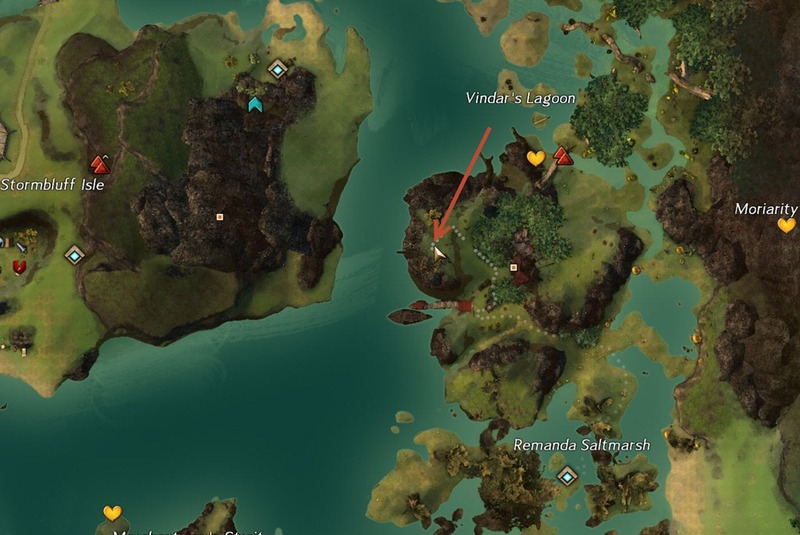 Head to Ridgerock Camp Waypoint and head north. 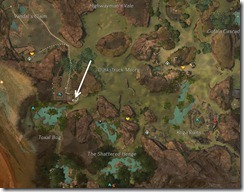 You may see a chest at the location indicated below. 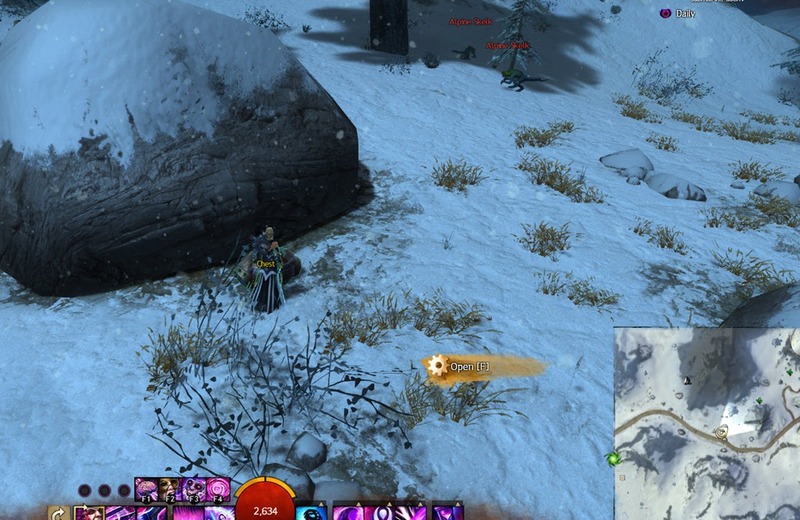 if so, opening it will spawn a Skritt Burglar. 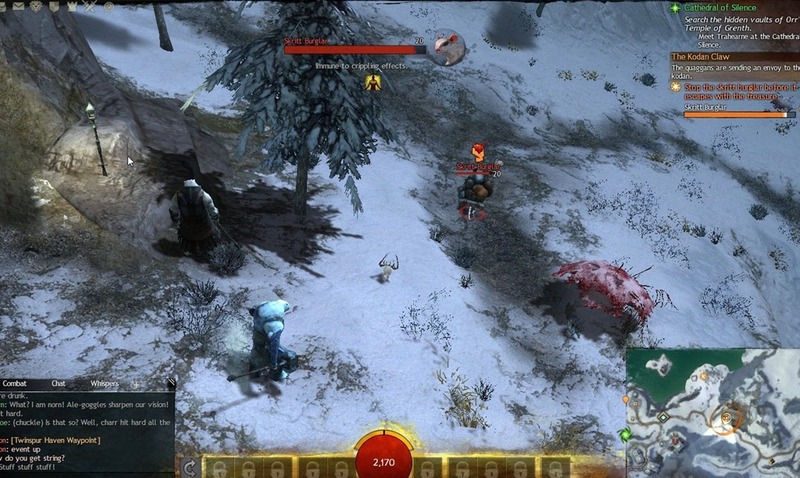 Follow him along (while attacking him) and he will turn you to a Jacklop and grant you the achievement! 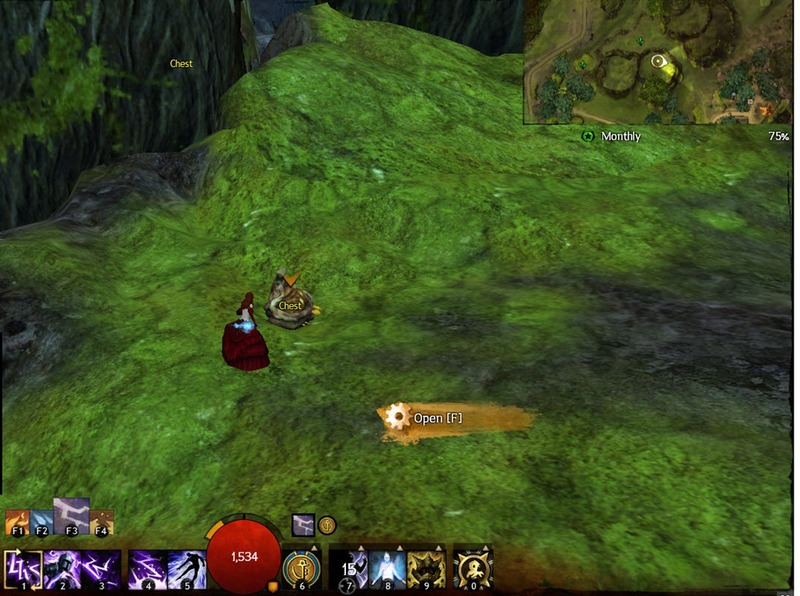 If you manage to kill the Skritt Burglar, he will drop a big bag with 3-4 items (mostly green items). 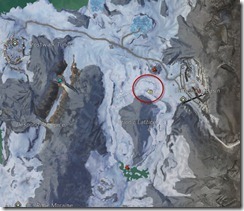 Reader sipertruk discovered another possible location for the chest. 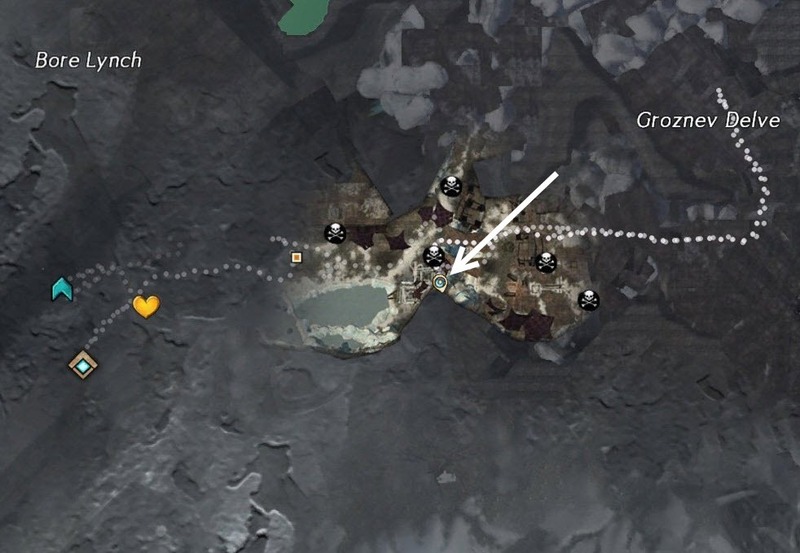 Thanks Theo for the verification. 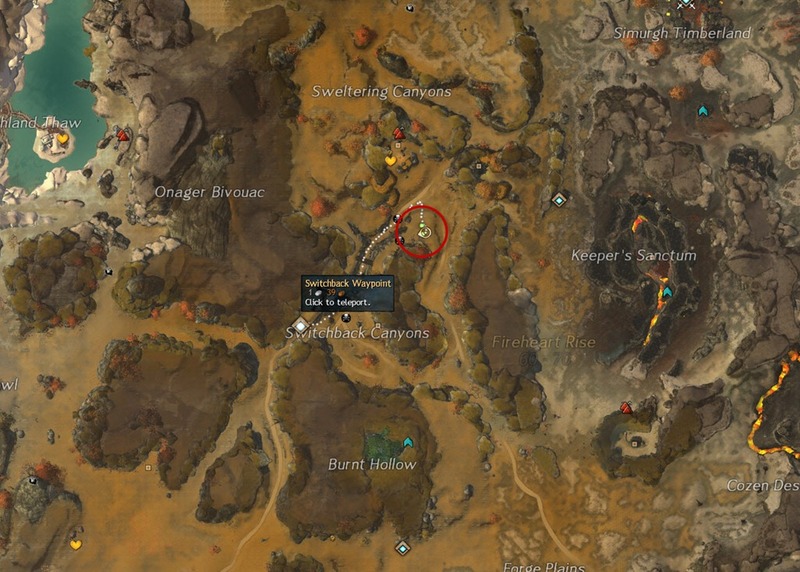 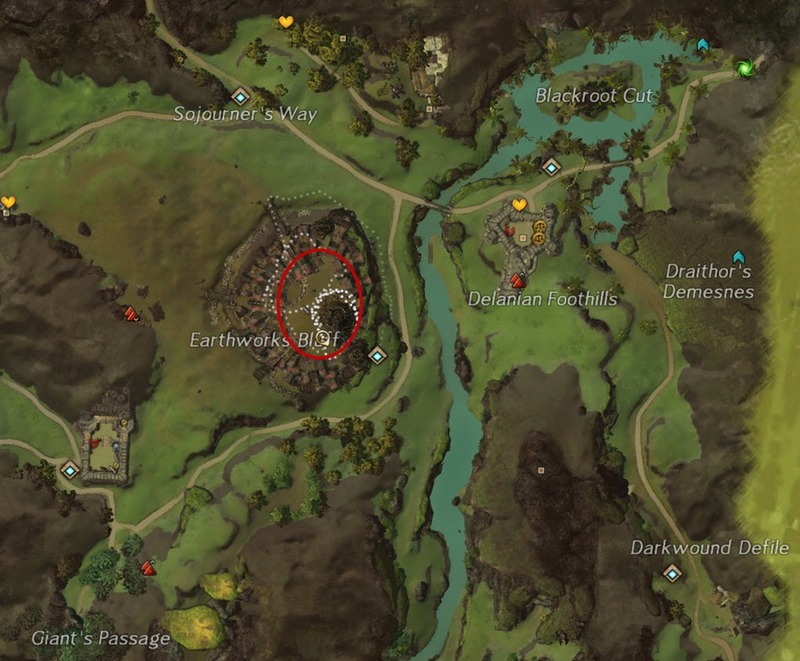 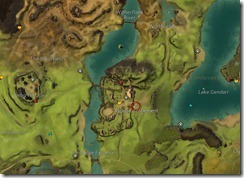 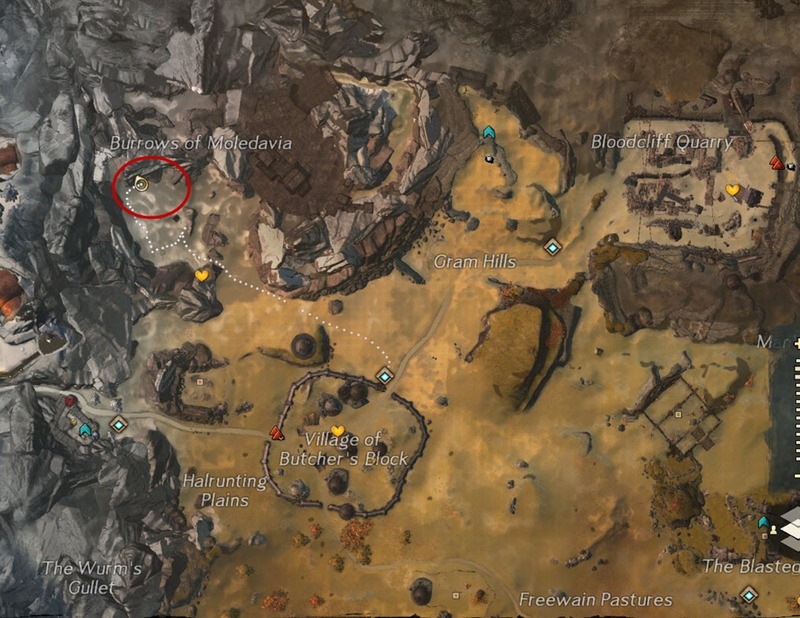 Reader Jayntree found a third possible location for the chest, in the minds in the SW part of the zone. 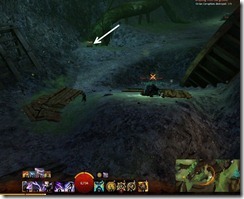 Reader Pomphe DrakkarLake provided an addition pic for this location. 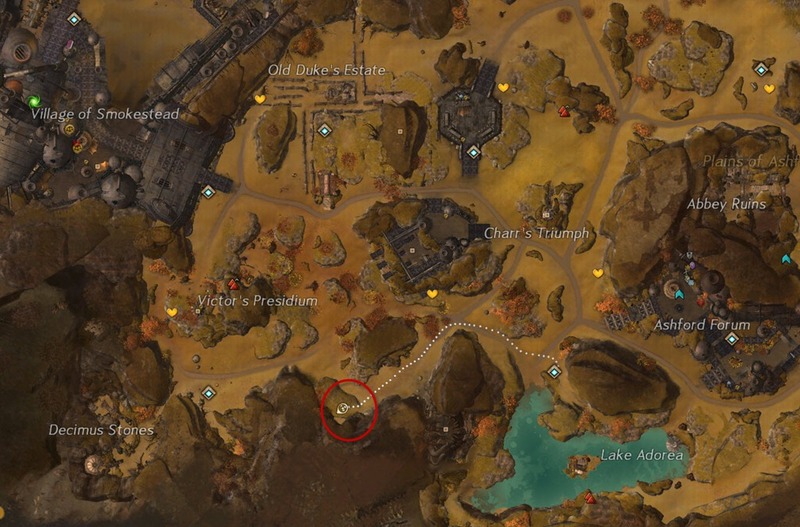 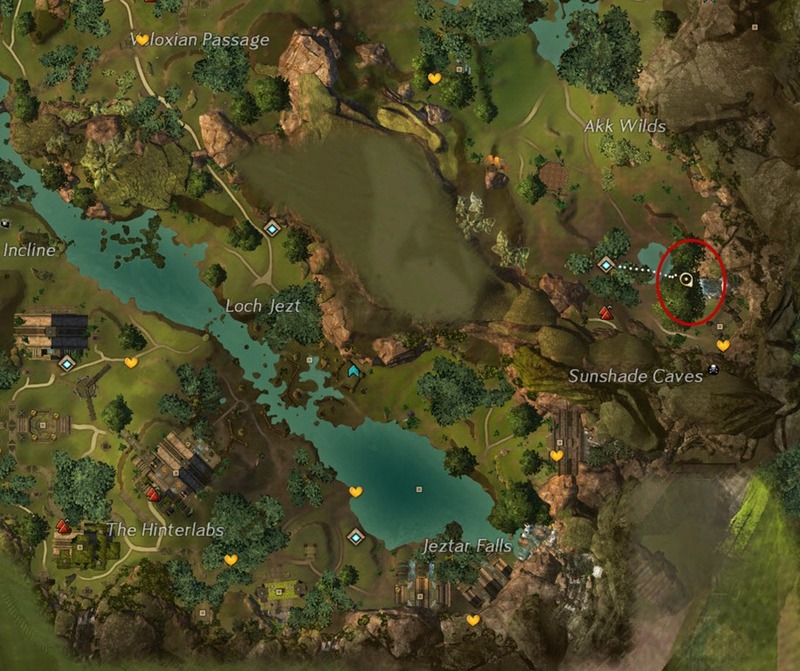 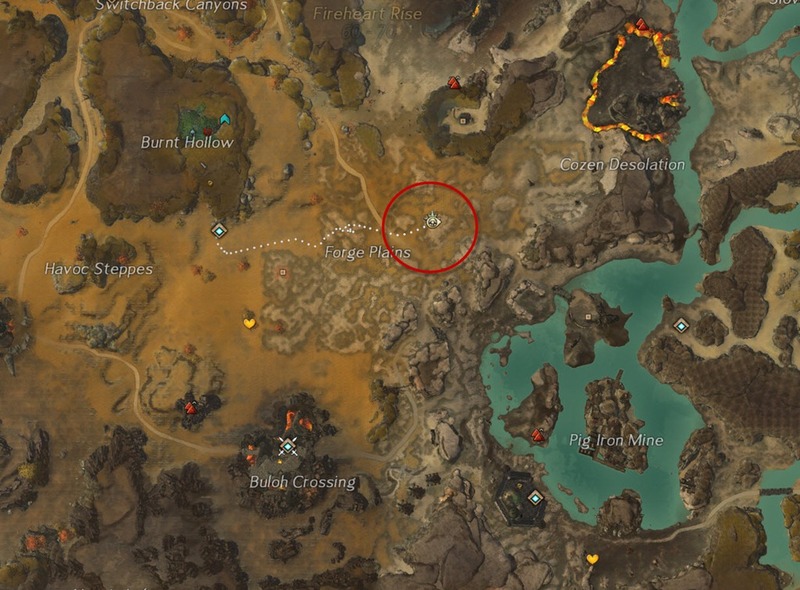 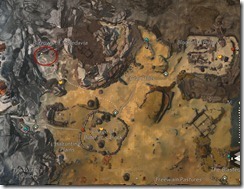 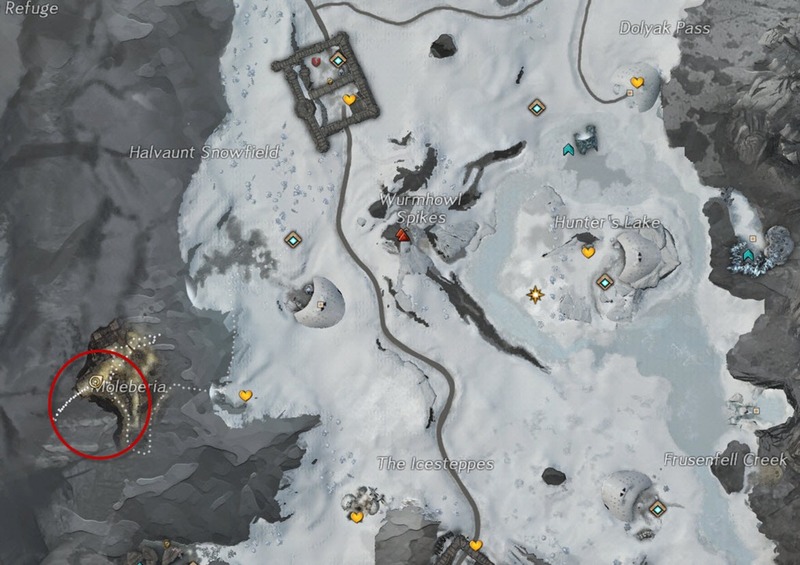 There is supposedly a chest south of the circular ramp in one of the Dredge tent/shacks at SW corner of the map. In the canyon below filled with ice elementals and ice imps, there is supposedly a chest in there. The circle draws an approximate location. 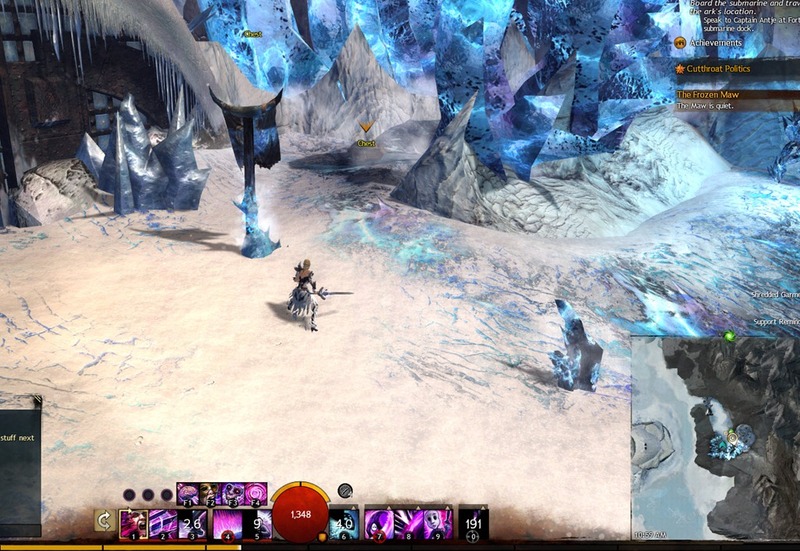 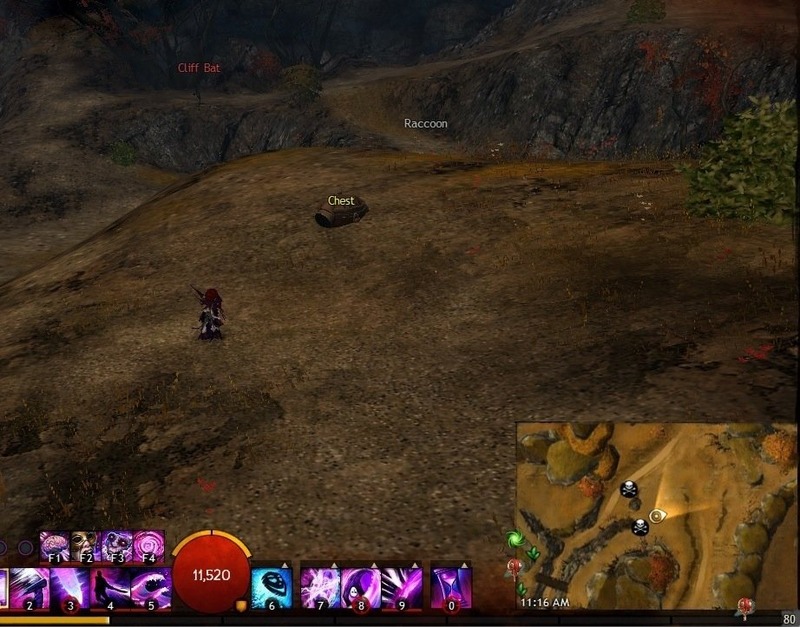 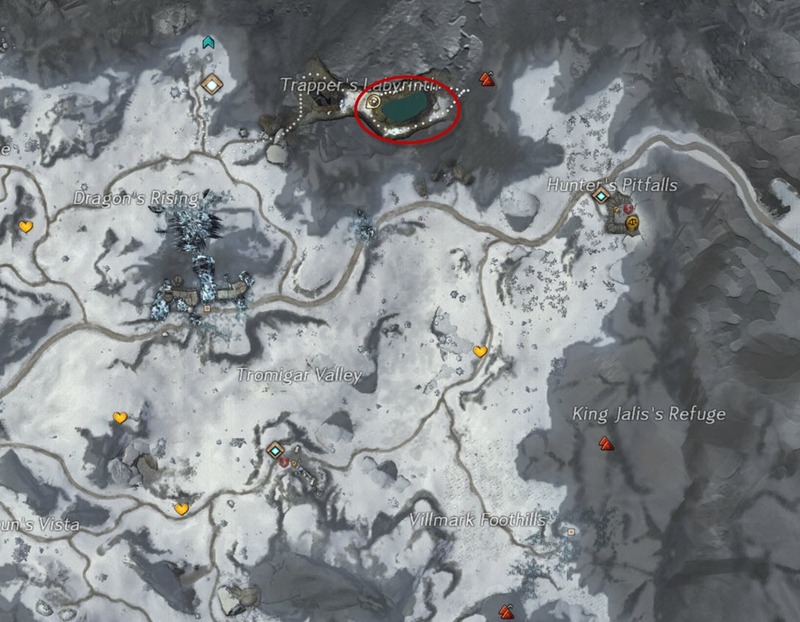 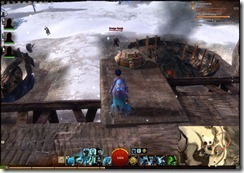 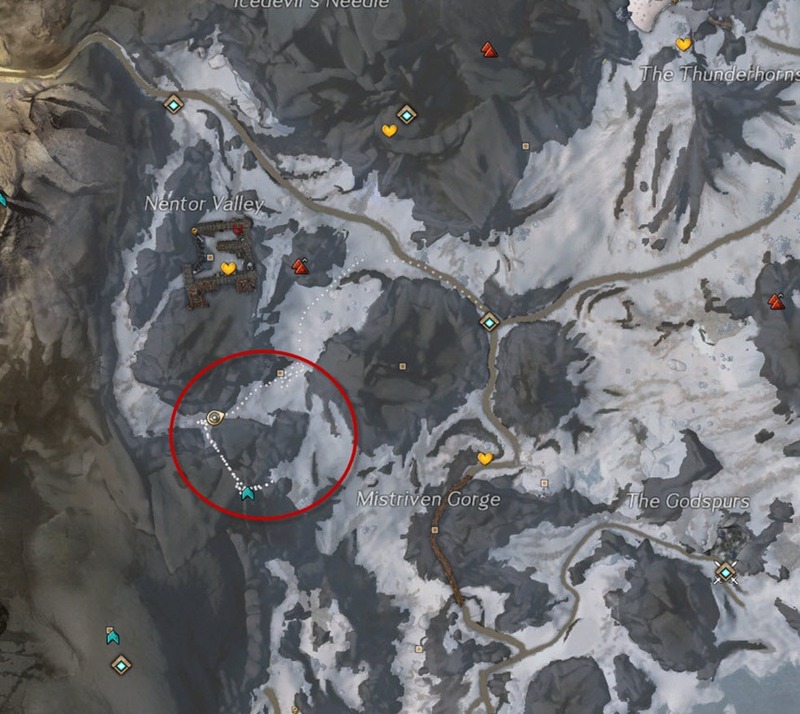 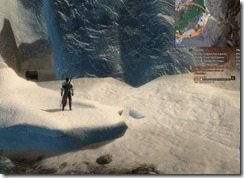 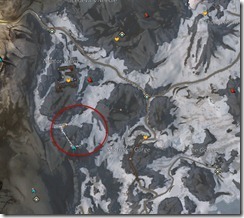 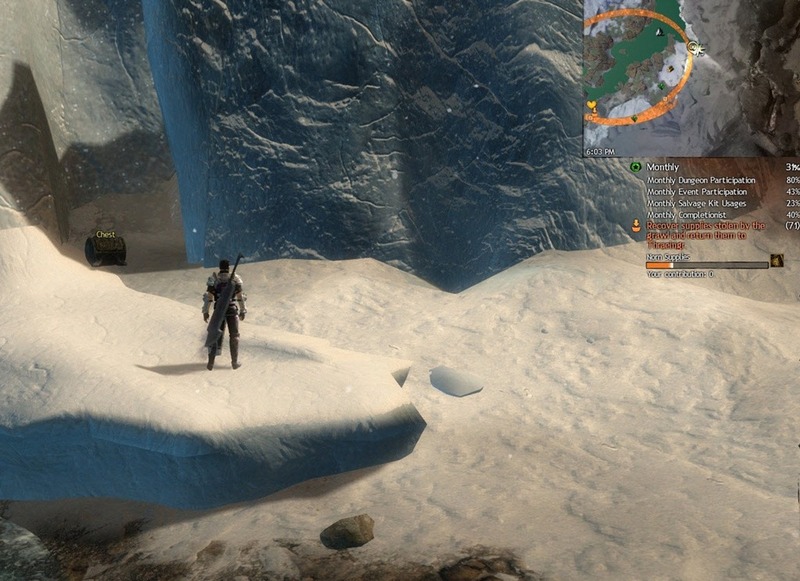 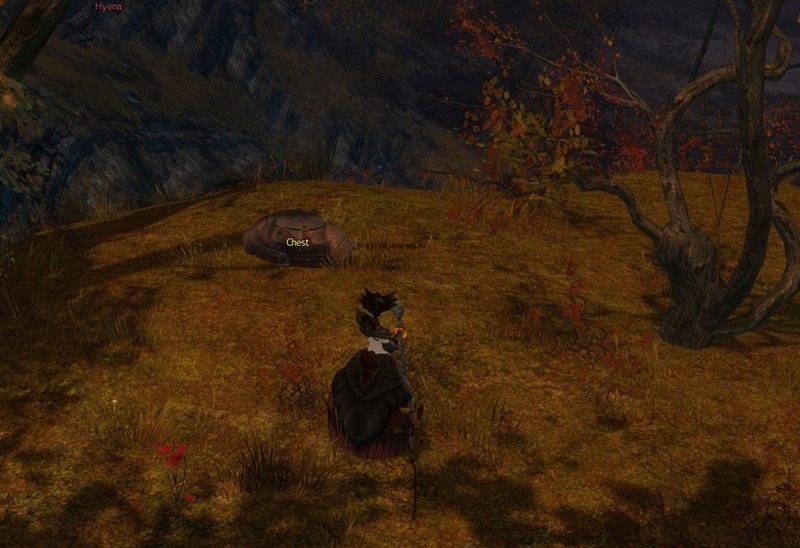 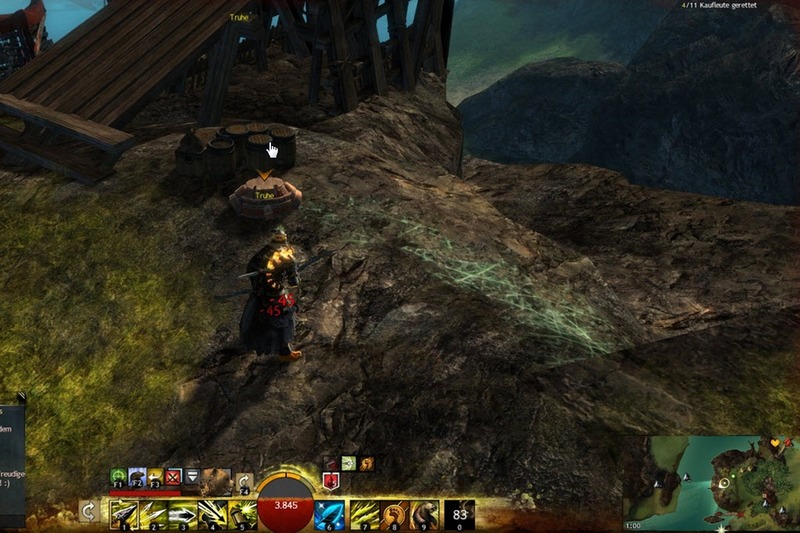 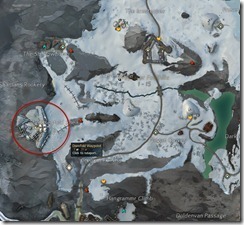 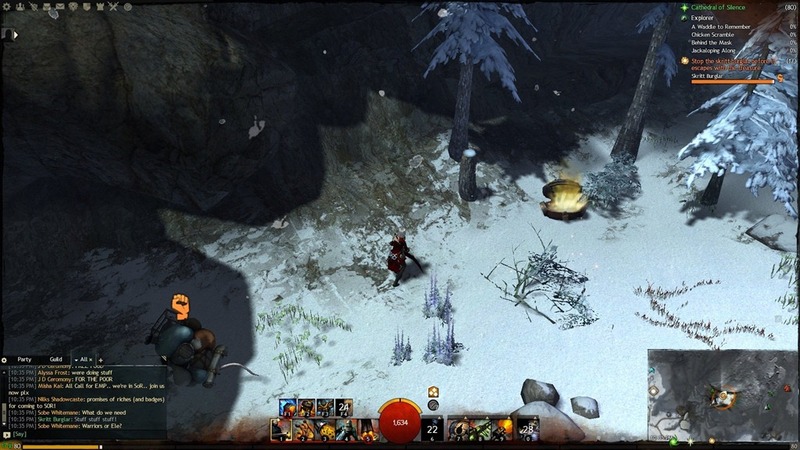 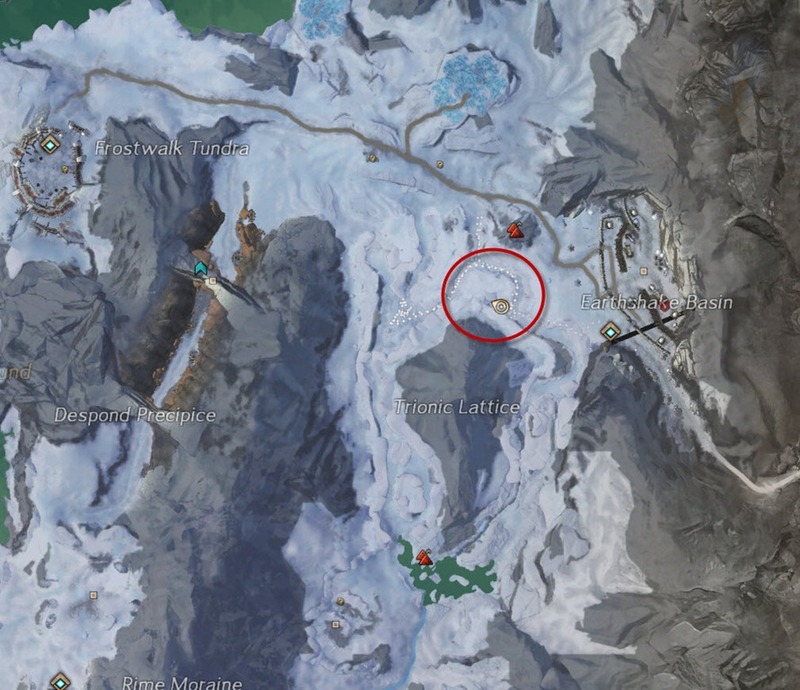 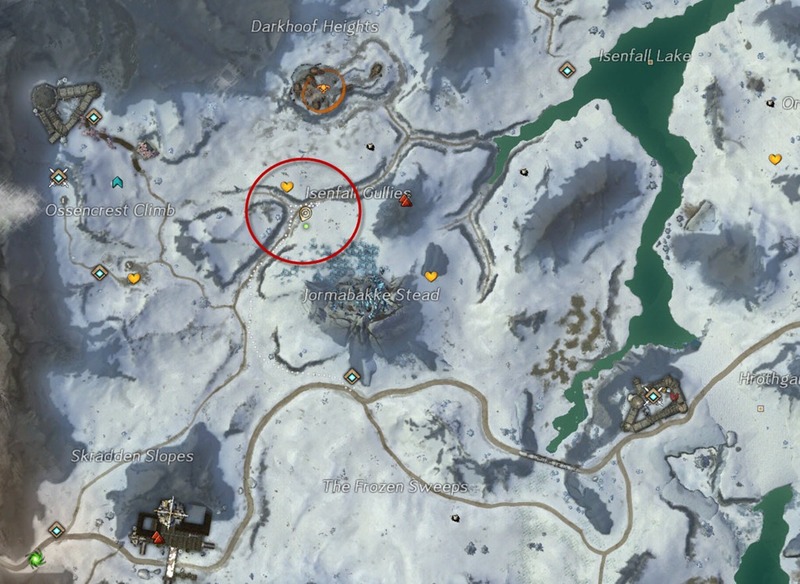 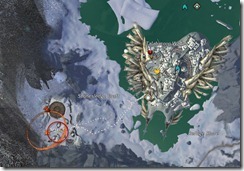 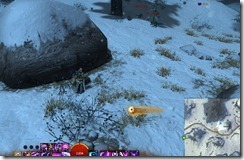 Reader Karu found the chest in this location on the very south of Snowden Drifts. 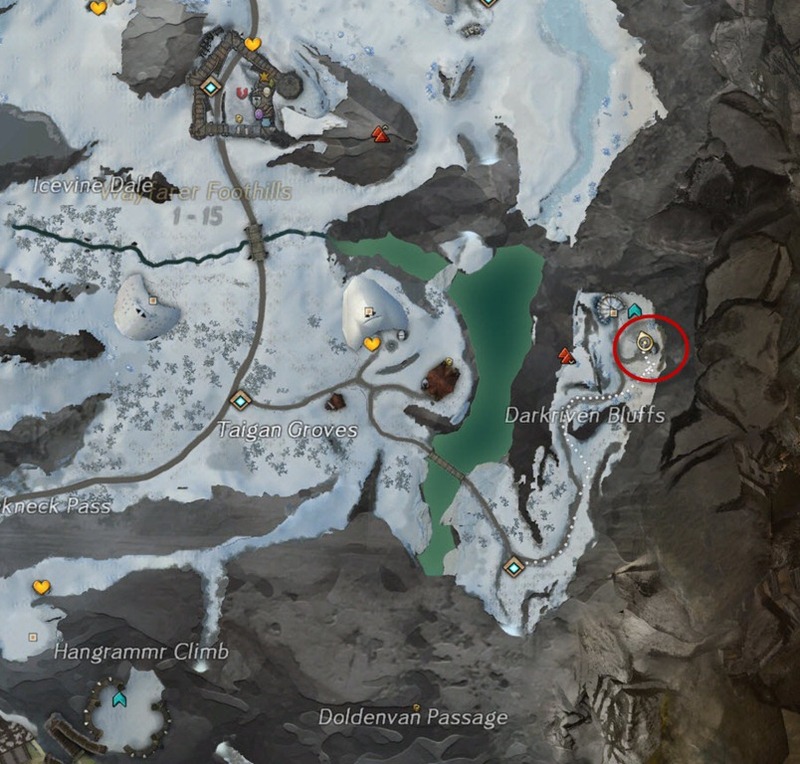 The chest is NE of Hrothgar’s Pass, near a big rock not far from the main road. 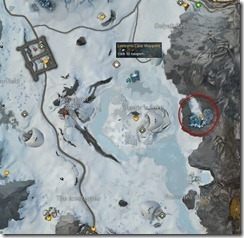 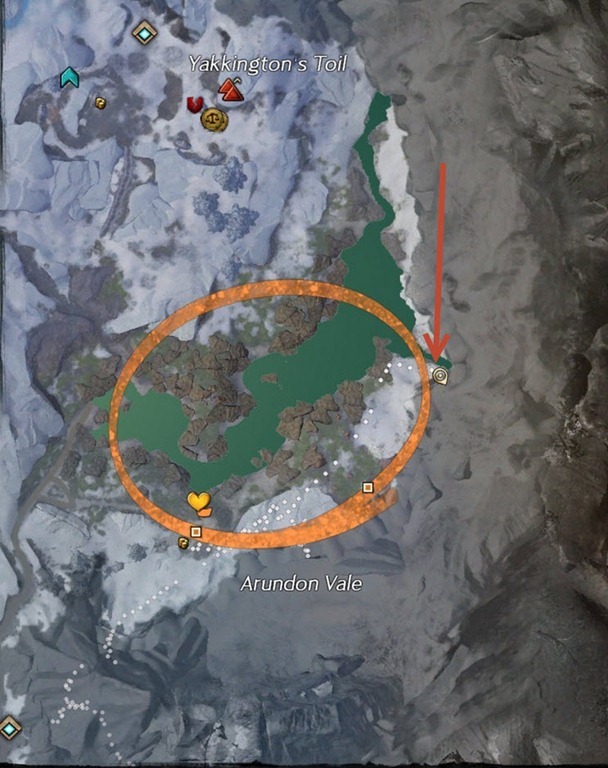 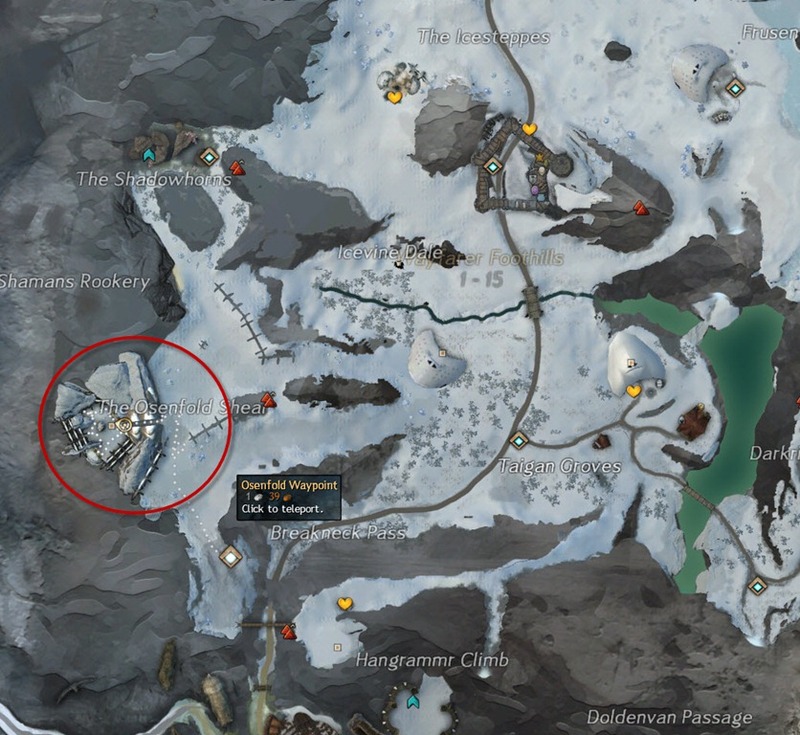 There is supposedly to be a chest between the the Frostgorge portal and the vista in the snowy area. 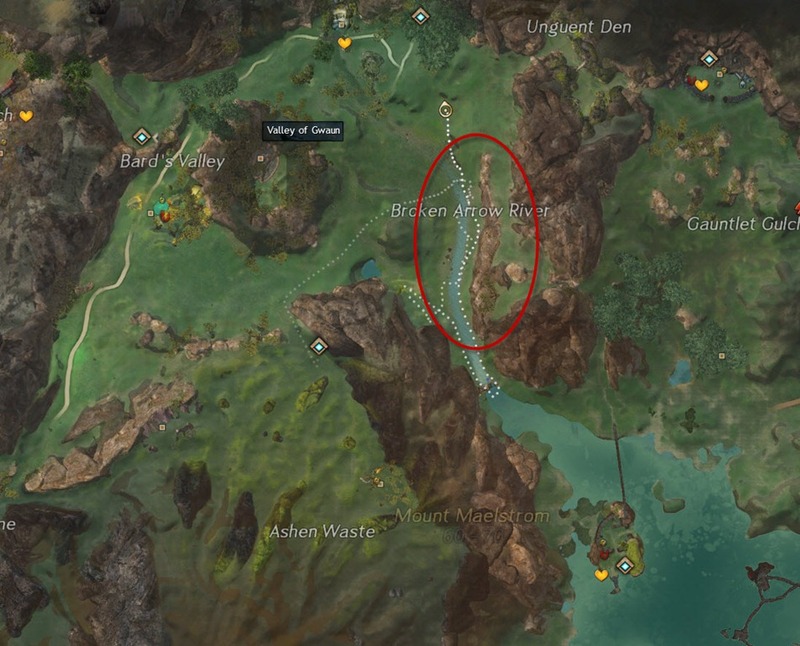 There is supposedly a chest between just west of Drakentelt. 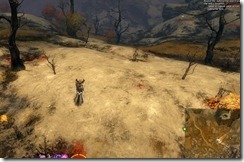 Elicha found another location way north in Wayfarer Foothills. Check the Moleberia, especially the SW corner. 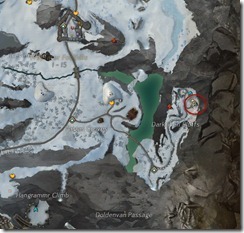 Check the grawl caves to see if there are any chests.